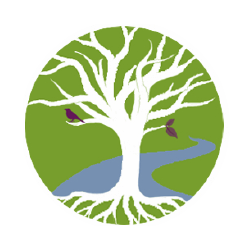 The logo that we use for Prophetics has been created by a dear friend Mary Kathryn Lee from High Point, North Carolina. She has helped us capture the essence of what Prophetics is all about. The tree symbolizes the Tree of Life which is a symbol that is highly recognized by all nations and religions. We are an international e-commerce gallery website and want to reach the nations with the creative pieces that we sell. We believe our art has a way of touching the very soul and it can be life transforming not only to individuals but also to the very cultures around us. If you Google “Tree Of Life” you will find there is much more to learn by this symbols significance. In Revelations 22:2 the bible states that the Tree of Life’s leaves are for the healing of the nations. We know that art moves people but it also has the capacity to heal and bring about awareness. We at Prophetics feel that the leaves signify all the individual pieces of art that we are offering to the world. Our hope is that the art will indeed heal the nations. The unrest and turmoil that we see in the world today shows us the need for healing and love. We believe that our talented artisans and craftsmen are divinely anointed to bring about healing along with joy, peace, happiness, and the love of God through their creativity. We like to call this a “new” renaissance and it is very different from the renaissance period of old. The first renaissance that emerged in the late Middle Ages in the 14th century and continued into the 17th century was seen as a true revival force. The Renaissance movement was a critical source that spurred progressive thinking, explored human emotion, expression, knowledge, and understanding. The Renaissance period had a way of opening many advances in the area of culture and the art created during that period played a significant role. Today we see much of this historic Renaissance art on display in major art museums throughout the world. These historic pieces still inspire us today. I believe that God is speaking to us of a “new” renaissance that is intent on pouring out His spirit and showing the world His love. This love has the ability to change emotions, develop stronger cultures and bring about a better knowledge of understanding and purpose. God reveals Himself to us in so many ways and I believe art is one of His finest mediums. Art has a way of drawing us in and creates emotions that go far beyond our ability to speak. It is a universal language that uses visual means to stir deep emotions and calls us to a deeper awareness. The color meanings that we listed have significant importance to our company’s foundation. We want Prophetics to be well grounded, strong, and bringing support and encouragement to our customers as well as our talented team of artisans and craftsmen. 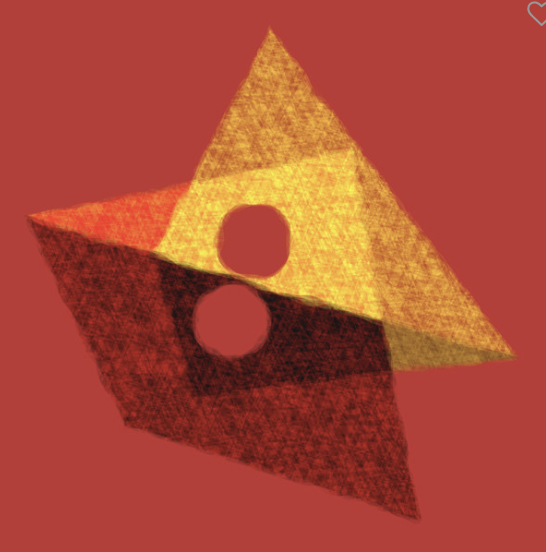 The circular design of the logo is two-fold. First, it symbolizes bringing art to the world and leaving a legacy that will continue for generations to come. And second, this symbol will be cast in metal to form a logo that can be put on shoes, purses, and more to help raise money for charities and funding artisans in different nations to start businesses and help eliminate poverty. It’s our way of giving back. They say “a picture paints a thousand words” and we at Prophetics believe that the pieces we sell in all mediums will do just that. Our artisans and craftsmen meticulously hand craft fine pieces that will inspire people for centuries to come. Let the “New” Renaissance begin and bring a revival of God’s love like the world has never seen to help change the lives of His children and the cultures in which they live. artists from 17 countries including Argentina, Australia, Barbados, Brazil, Canada, Cayman Islands, Denmark, Germany, Kenya, Netherlands, New Zealand, Serbia, Sir Lanka, South Africa, Sweden, United Kingdom, and the USA and growing. We have over 500+ pieces of art, photography, sculptures, jewelry, apparel and more. Click here to purchase this jewelry! Click here to purchase this artwork! 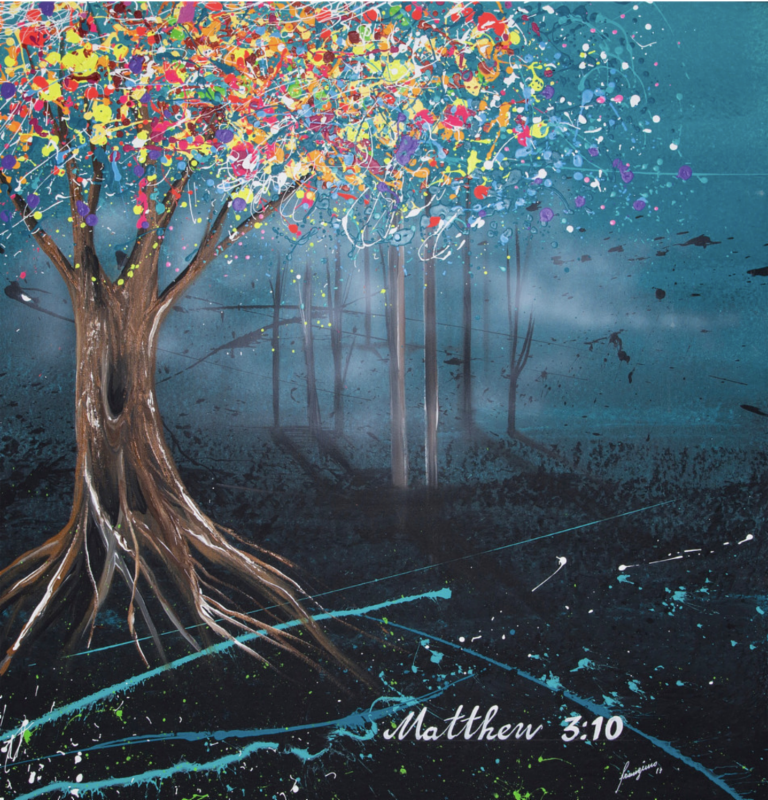 "Jacob's ladder - Unseen World"
Art has a way of bringing hope, encouragement, and healing to so many people. type of art gallery program. These traveling themed galleries created by our artists also caught the attention of countless individuals and communities through social media and local TV news stations. The traveling galleries that we offer are a wonderful way to bring the Christian visual arts back to your community. 1-844-559-9500 or email her at Propheticsgallery@gmail.com. A great way to tithe a little extra to your church! gross sale to the church assigned that code. Church Form Link click here! Happy Easter from Prophetics Gallery! Please visit our website to select from over 66 artists from 12 countries including Australia, Cayman Islands, Kenya, Netherlands, New Zealand, Sir Lanka, South Africa, United Kingdom, Argentina, Brazil, Canada, and the USA. We have over 500+ pieces of art, photography, sculptures, jewelry, apparel and more. 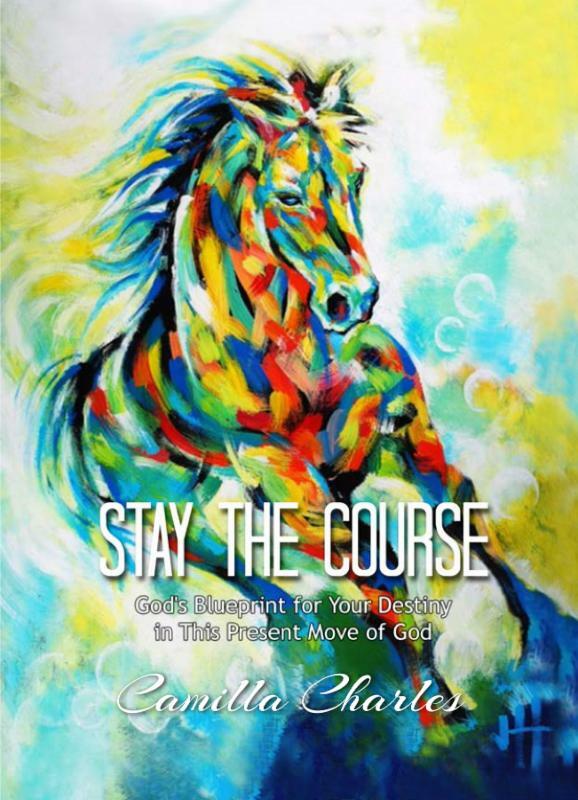 Give the gift of Prophetic art! Richard Bond is from Lakeland, Florida. He began a series of "Brown Drawings" with the purpose to start a personal visual language that could evolve over time. These "Brown Drawings" have their own technique, symbolism, and subject matter. Most of these drawings relate to Richard's own personal life and influenced by his dreams, struggles, his cultural and spiritual beliefs. 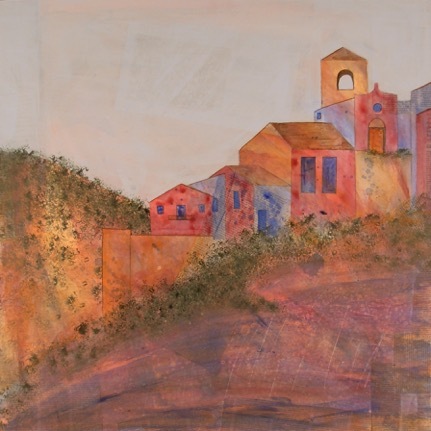 Richard creates his artwork using various mediums such as sepia and oil pastels, oils, lino cuts, watercolors, etchings, mixed media, and sculpture. The diversity of media that he uses changed the style of the "Brown Drawings" dramatically. 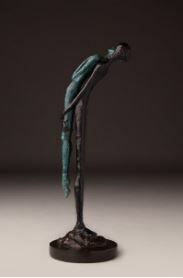 Richard is a graduate of Florida Southern College and has studied under the master Amos Supuni, a Shona Stone sculptor. 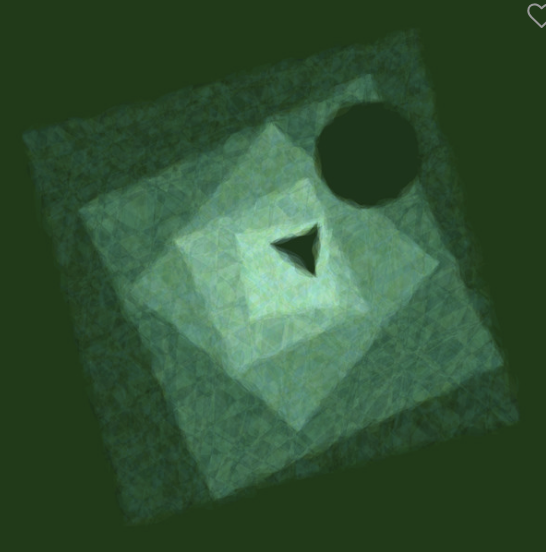 Supuni has had a profound effect on Richard's artwork. Please read more about Richard on his artist page by clicking on this link below. Visit Richard Bond's Artist Page and artwork! 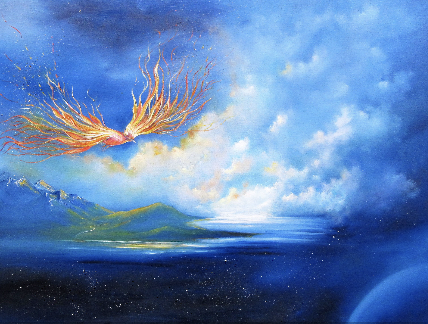 "The Fire Of The Holy Spirit"
Francigênio Castro is from São Paulo, Brazil. His inspiration comes from Jesus as he creates his images and he inspires himself with the goal that people's destinies can be changed through art. His creations come to him through dreams and visions that he receives from God in worship. He then finds a bible verse that corresponds with that dream or vision. Francigênio has developed an on screen panel with acrylic and oil paints and uses a brush, spatula, and airbrush to complete his artwork. He also creates silk chiffon scarves/shawl's with many of his images and they are available for sale on our website. Francigênio is a self-taught artist and has exhibited in galleries in Brazil and New York. Please read more about Francigênio and view his art by clicking on the link below. 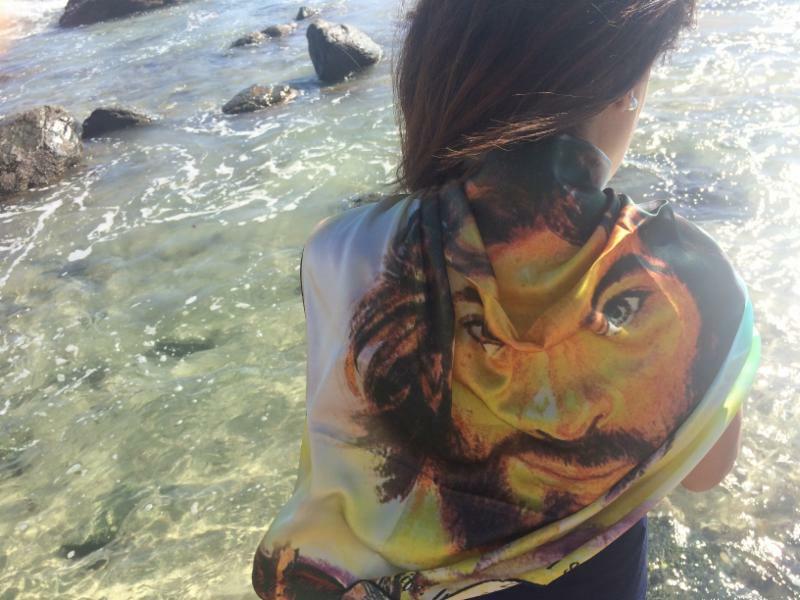 View Francigênio Castro's Artist page and art & scarf collection! Sarah Rowan Dahl currently lives in Otford, Australia but is native to South Carolina in the USA. She is a speed painter who God has placed in the mainstream world and she desires to create a bridge through her artwork. She finds inspiration in everything from the Word of God, movies, laughter of children, creation, trials of life, adventures, food and more. Sarah paints to help end human trafficking. She has a BFA in Studio Art from Converse College in Spartanburg, South Carolina. 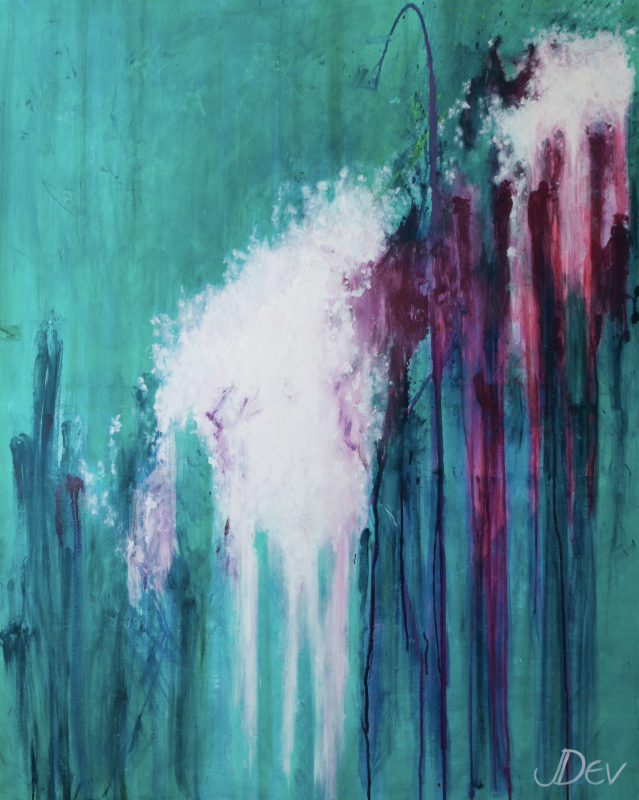 She creates Abstract, Expressionism, and Contemporary works of art. Please visit Sarah's artist page and artwork by clicking on the link below. Visit Sarah's artist page and artwork! Donna Godwin is from Hillsville, Virginia. Her inspiration comes from God when she hears the Word of God, worships, see's a prophetic dance or hears a story. The Word comes alive in her heart and then sees an image to paint. 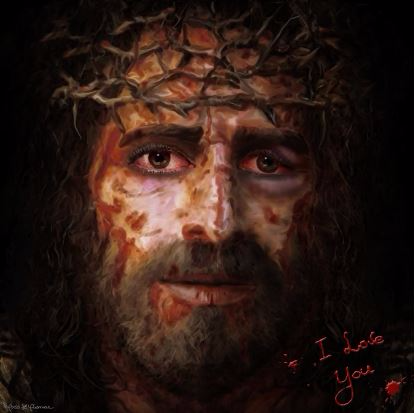 These images come from the heart and reflect the love of The Father. 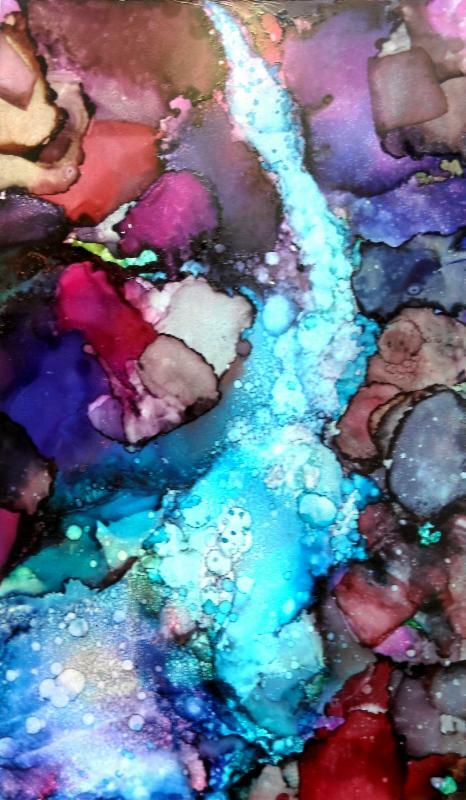 Donna uses a variety of materials when she creates her images such as alcohol inks, acrylic paints, and mixed media. She also enjoys creating with art pieces with wood. Donna has worked with many churches, revivals, in home and outdoor exhibits, and workshops in Virginia, Tennessee, Indiana, Alabama, and North Carolina. She loves to encourage the church to wake up and use the arts that God has placed within each person to bring healing into the hearts of all people. Please visit Donna's artist page and artwork by clicking on the link below. Visit Donna's artist page and artwork! Ineke Hopgood is from Ocean Shores, Australia. 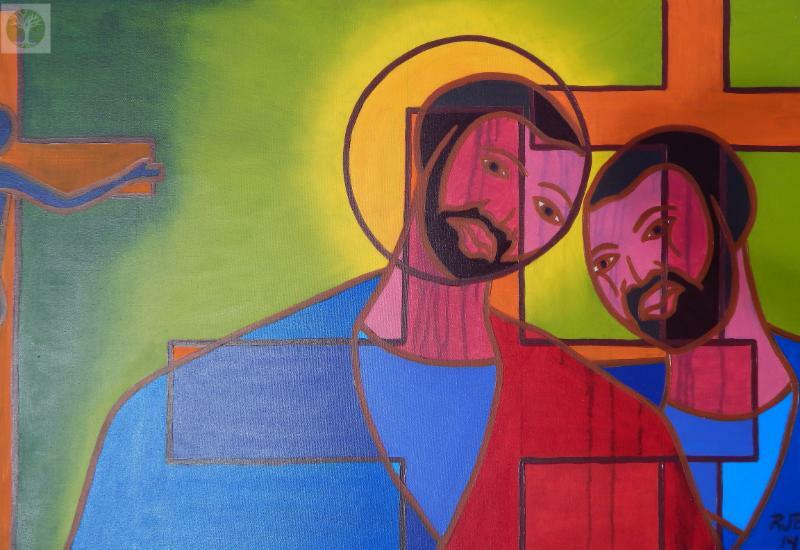 She creates visual art to preach the Gospel. Her inspiration comes from Scripture and to see God bring His heart to the nations. 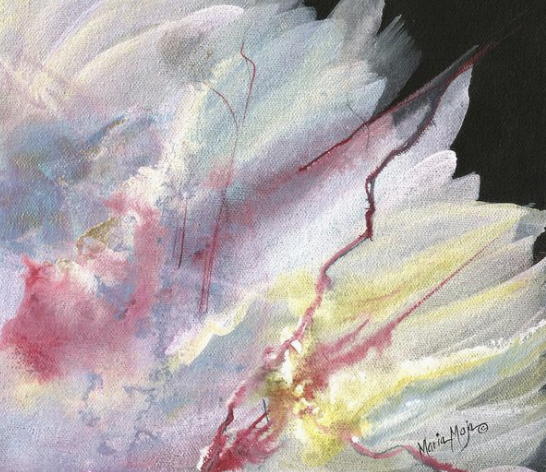 Ineke is a self-taught artist who loves to work with watercolors because of the way the paints merge and form shapes and then she interprets them prophetically. 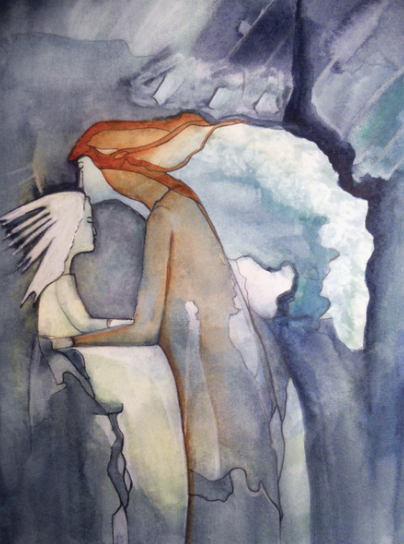 Please visit Ineke's artist page and artwork by clicking on the link below. 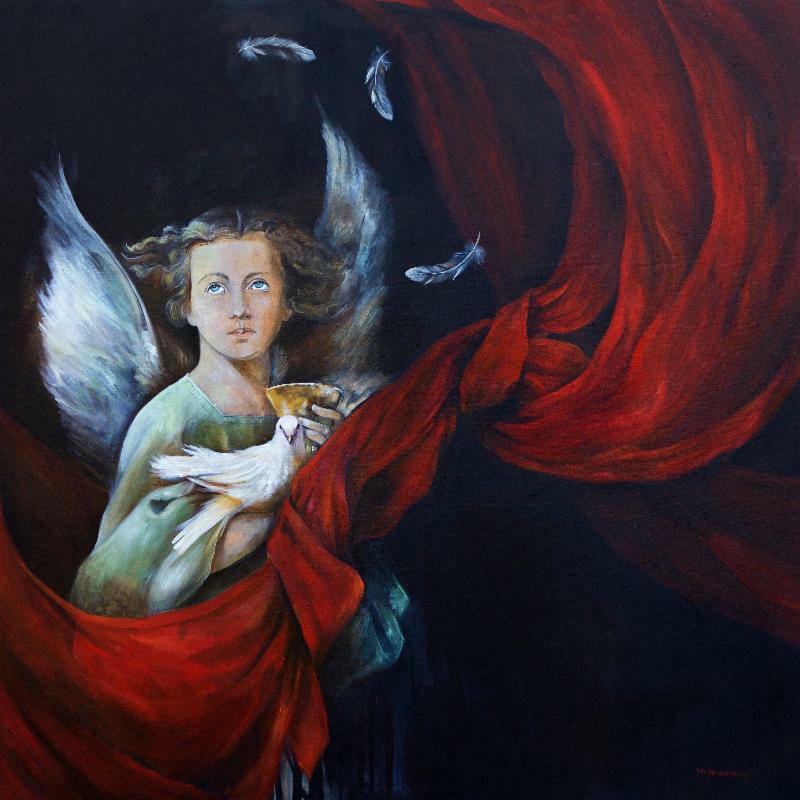 Visit Ineke's artist page and artwork! 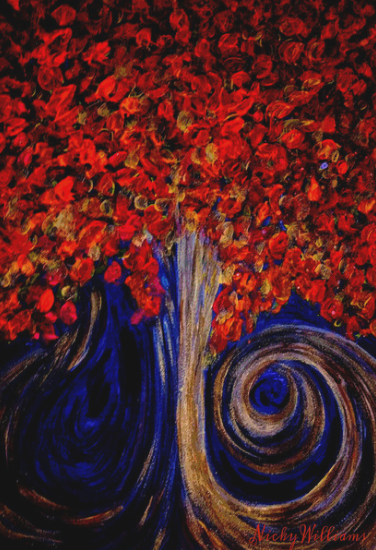 "Red Tree On A Dark Night"
"Angel In The Ocean Of God's Love"
Nicky Williams is from Rosendale, Maryland. The love of Jesus inspires her and she is thrilled that God is using her love of art to create works that are inspiring hope in others. She wants people to know the love of their Heavenly Father. Nicky opens the Bible to see what scripture God wants her to use in her artwork and plays worship music as she paints. She prays throughout the art creating process with each piece she paints. 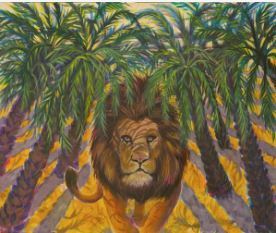 Nicky also uses anointing oils in her artwork to demonstrate that her works are an offering to God. She is a self-taught artist and practices with different mediums of paint such as watercolors, oil paints, and acrylics. Please visit Nicky's artist page and artwork by clicking on the link below. Visit Nicky's artist page and artwork! "The Rich Man And Lazarus"
David Wojkowicz is from Prague, Czech Republic. 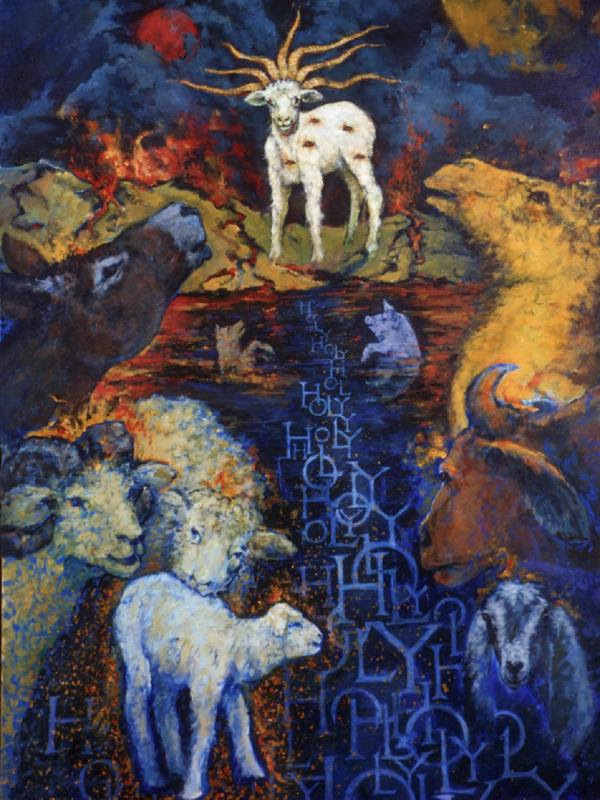 All of David's paintings are inspired by the Bible by one or two verses or part of a whole biblical story. He paints by hand on the computer using vector graphical software. His paintings are a result of blending many similar or dissimilar partial images. 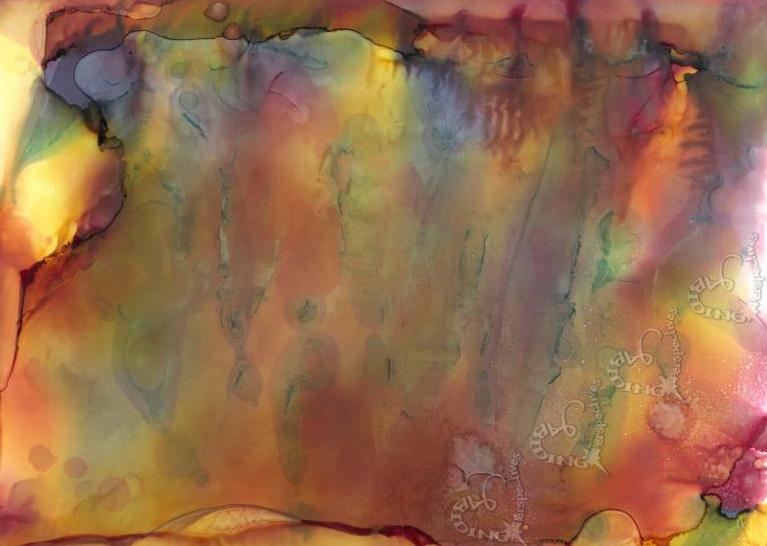 Then he prints the paintings by pigment inks on archival paper to create limited editions of his artwork. David is a self-taught artist with a Master's degree in Theology from Charles University in Prague. Please visit David's artist page and artwork by clicking on the link below. Visit David's artist page and artwork! God has designed a special purpose for all of us. He has given us dreams, visions and a destiny for our life. We may prefer to retreat, fall back, not push the limits for anything outside of the norm of our comfort zone. But wait...for the dreamers, the persistent ones, the stubborn ones who won't take no for an answer, the childlike who believe beyond what they can accomplish in a God who shines best in the impossible...this book is for you. I love the passion that Camilla Charles has for the Kingdom of God. When I first met her, I knew she was a woman who loved the Lord and was committed to a life journey with Him. She has helped many walk with the Lord. Through her book, she can help you. Camilla has the spirit of a trailblazer and is a catalyst in what God is doing and wants to do in this present move of God. She carries the presence of God and is pressing in for revival for her region. She has a huge heart for the nations and to see the Kingdom manifest. Camilla speaks and sings regularly for conferences, churches and other Christian events. She has a passion for God's Word and longs for real transformation. Camilla believes that true revival is "His arrival." Camilla encourages everyone to "experience His presence and see His glory." She desires to see transformation for the East Texas area, in this nation and into all the nations of the earth. Camilla encourages every believer to "Stay the Course" and walk in their God-given inheritance. Camilla pastors Bethesda Church in Lindale, Texas, with her husband, Steven. Bethesda is an apostolic revival hub for East Texas. Bethesda is the campus home for Bethesda Church School of Supernatural Ministry, East Texas House of Prayer, Transformation Center, and the Hub Coffee Shop. Camilla has recorded five music projects including "Windows of Heaven" and "Personal Encounter." She travels nationally and internationally in ministry and prophetic prayer events. She and Steven have two sons, Cameron and Christian, and make their home in Lindale, Texas. You may order her book by clicking on this link: Order Camilla's book here! Please visit our website to select from over 59 artists from 11 countries including Australia, the Cayman Islands, Kenya, the Netherlands, New Zealand, Sir Lanka, South Africa, United Kingdom, Argentina, Canada, and the USA. We have over 500+ pieces of art, photography, sculptures, jewelry, apparel and more. Samantha Black is from Glen Innes, Australia. She is inspired by God's love and sharing His love with other's through art. 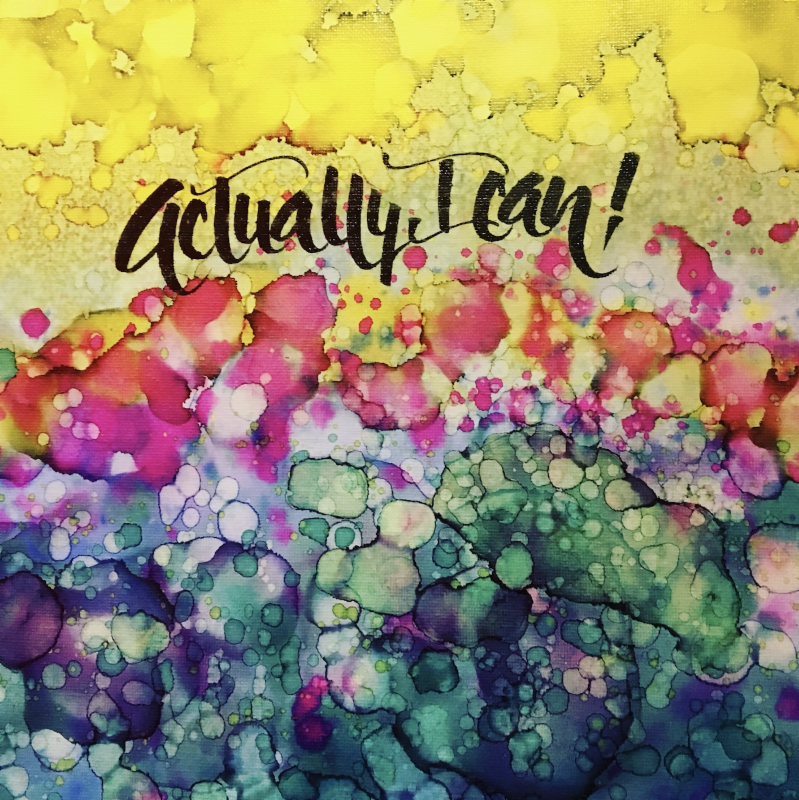 Samantha loves experimenting with different media and then adding elements to the artwork to highlight the message, bring extra light, and to enhance textures. Samantha's inspiration comes from the word of God, her encounters with Him, and her journey of faith. She loves using her art to draw others to Jesus. Art has also been a tool that God has used to help her through difficult situations to draw close to Him and encourage her and others around her. Please click on Samantha's link below to see her entire collection with our gallery and purchase a print or giclee of one or more of her art pieces. Click here to link to Samantha Black's artist page! Denise Dahlheimer Is from Maple Lake, Minnesota. She studied art history in school but went on to work in the fields of electrical/mechanical design and interior design. 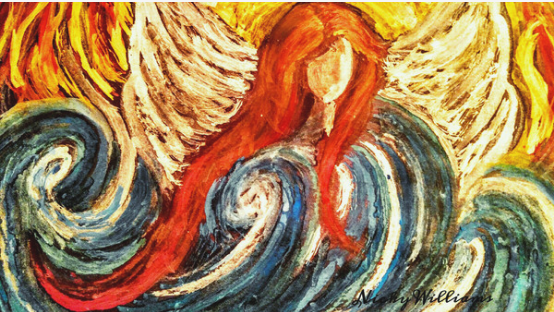 The Holy Spirit has inspired her in prophetic art bringing kindness, love, and hope to others by the canvases she paints on. 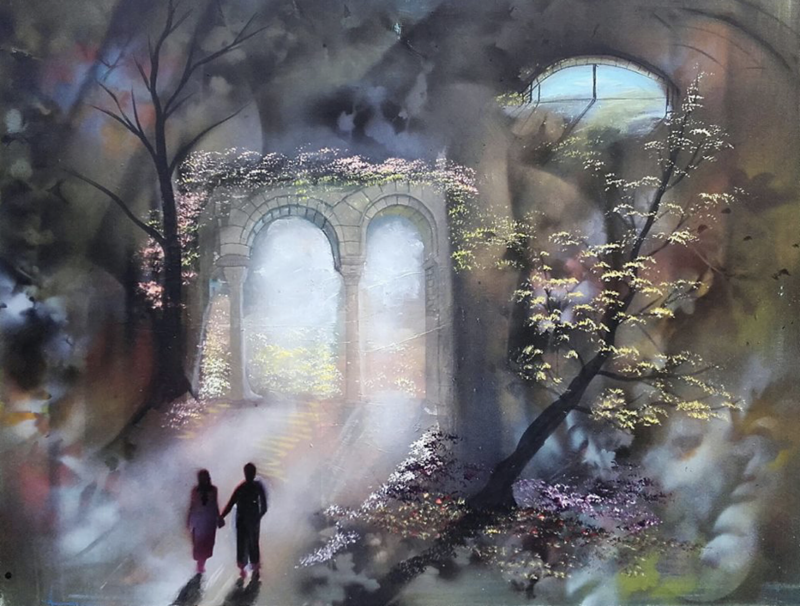 Please click on Denise's link below to see her artist page and see her entire collection and purchase one or more of her art pieces. 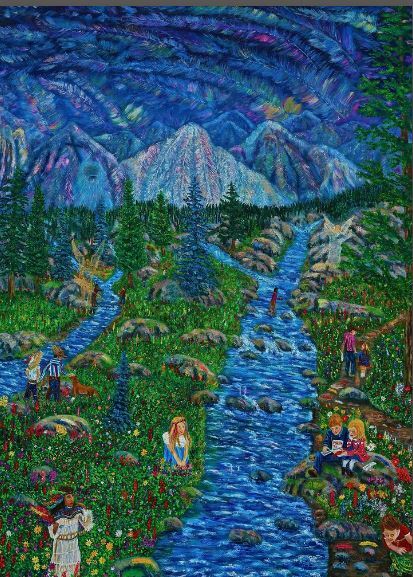 Click here to link to Denise Dahlheimer's artist page! Nicole Ramirez is from El Cajon, California. 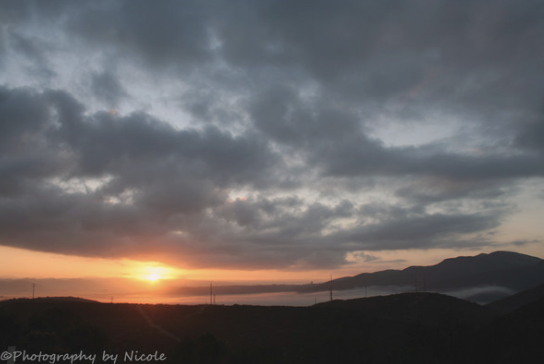 Nicole is inspired by life and God in creating her images. She loves to enhance her images with color to create amazing photography. She started an interest in the field of photography from high school in order to gain extra credits. 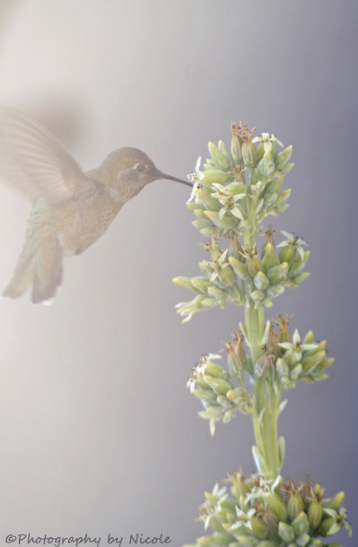 It was not long before a teacher realized her potential and encouraged her in photography. Nicole discovered that her high school teacher was not the only person who would encourage and compliment her on her photography skills. She continues to pursue a passion for photography and capturing amazing images on camera. God has helped her to capture images that create such joy, beauty and life to many. 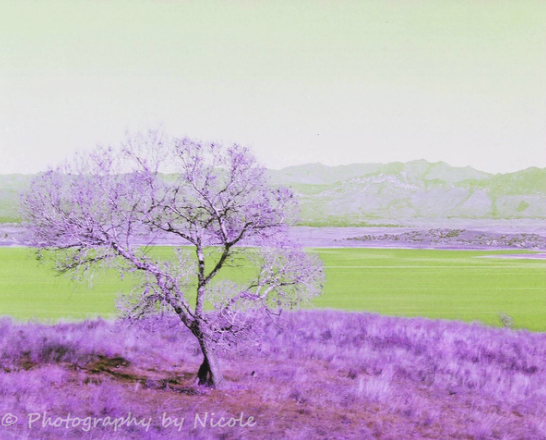 Please click on Nicole's link below to see her artist page and view her entire collection with our gallery and to purchase one or more prints of her amazing photography. Click here to link to Nicole Ramirez' artist page! Maria Maja-Schaefer is from Mequon, Wisconsin. She comes from a heritage of grandparents that were artists. 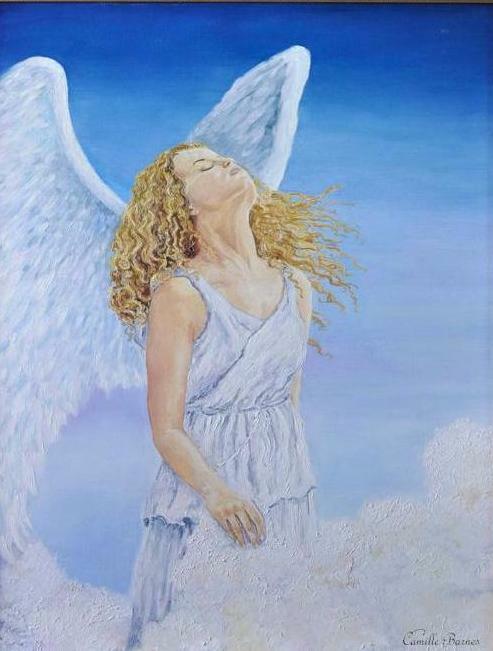 She is inspired by the Holy Spirit in her painting and is a self taught artist. 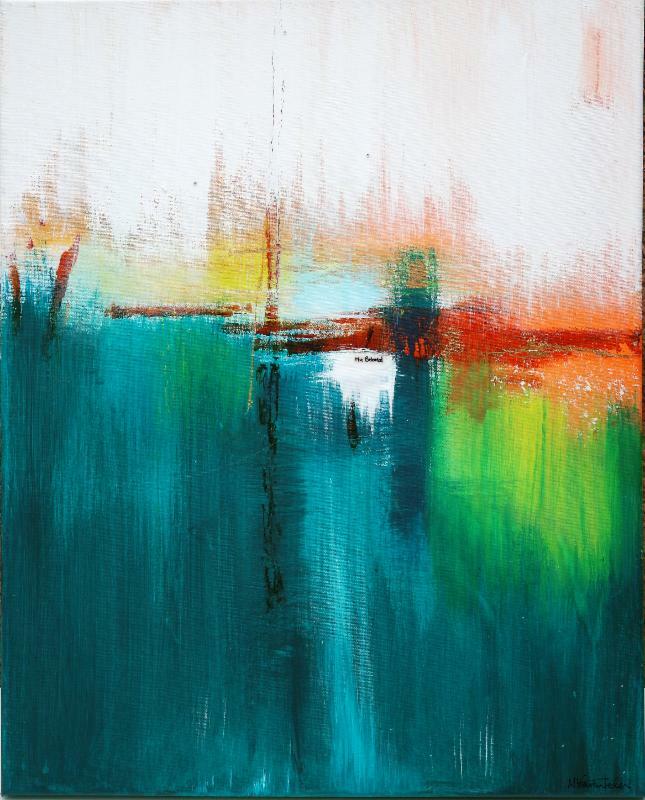 Maria's style is abstract and impressionistic and she paints mainly to bring healing to others as God leads her. 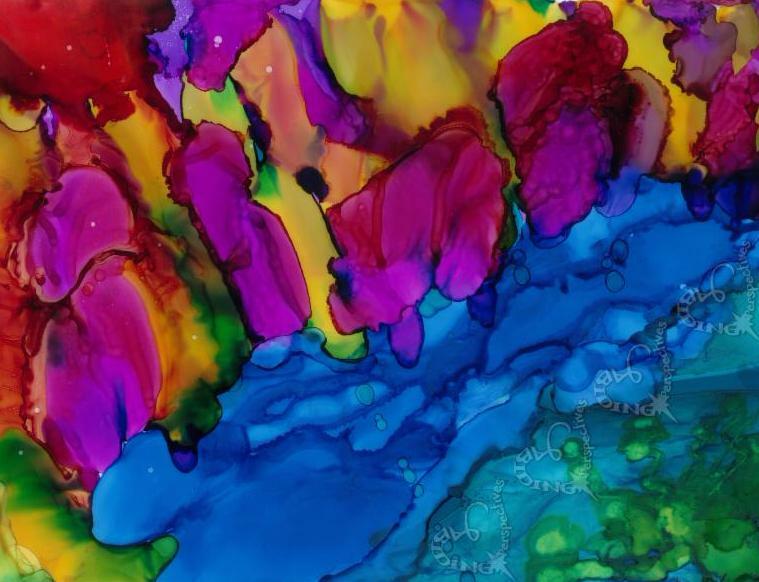 Maria uses watercolor, acrylic paint or ink when creating her art. She also creates mixed media artwork using a combination of materials. She paints on canvas, watercolor board or heavy watercolor paper. 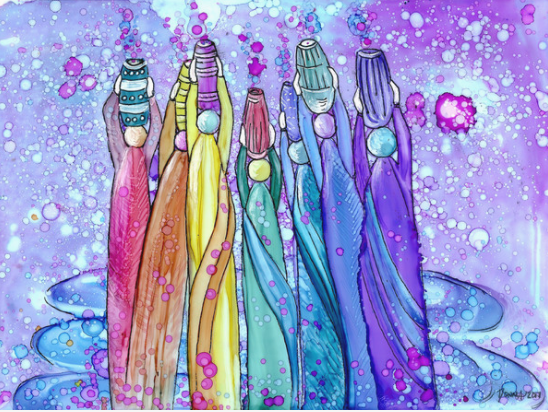 She has painted pieces for Hadassah Hospital in Israel and has shown her art in various galleries in Wisconsin. 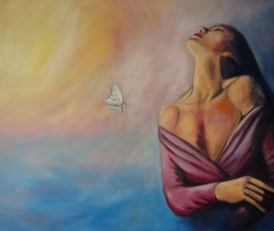 Please visit Maria's artist page by clicking on the link below to view her entire collection of art and purchase a print or original of her beautiful art. Please click on the link to visit Maria Maja-Schaefer's artist page! Art Workshops and Visiting Gallery Just For Your Community or Church Organization! awareness and change to many cultures worldwide. 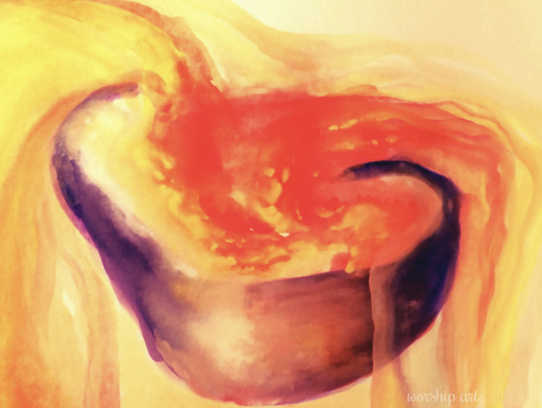 Prophetic art is anointed to bring hope, love, courage, and more to a hurting world. It is God's Rhema word in painted or creative form. The arts, like music, theater, and dance all have a way to move us and touch our emotions. Art also has a way to evoke deep emotions and move us. Art can elicit emotions we never knew we had or that we may have suppressed over the years. It can unlock parts of us in ways we could never imagine. Universities throughout the United States are now offering art therapy as a program of study. They have found that art has a way of unlocking emotions and it has been so successful in reaching people who often cannot express their feelings other than in art form. What many people do not realize is that art has been used for centuries by God to reach His people. It is a form of communication that goes beyond all language barriers to reach people and open doors of communication, healing, deliverance, and more. The arts are now being more explored in the church today. The church is returning to its grassroots and allowing art to be part of worship and used as a form of worship. Artists are taking the stage and joining the worship teams and painting during worship time. You will often find artists painting the most amazing art during church services. Also, there are many churches that are creating galleries for prophetic art. It is a wonderful opportunity for them to reach people in the church and the community. It is also a great way to express their love for what God is doing in their church in the arts. Prophetic Artists are anointed by God to bring heaven to earth. As a form of worship, these artists are communing with God and creating what He shows them in prayer. The things they paint often mean something for one person or several people. Their art has a way of touching them in ways no one could possible know if it were not for God 's inspiration. These artists can give you testimonies of how their art pieces have literally effected peoples' lives for the good and led souls to Christ, brought healing or freedom. 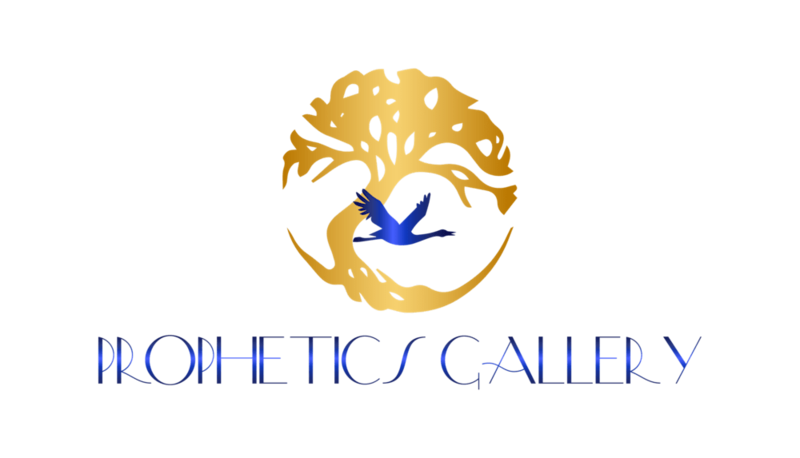 Prophetics Gallery is the place to go to find the most amazing prophetic art and artists and craftsmen from around the world. We have over 57 artists in 11 countries and that number is still growing monthly. You can choose painted art in various mediums, sculptures, photography, digital art, handcrafted jewelry, apparel, and more. We also offer prints as well as original artwork with over 450+ pieces in our gallery to choose from and enjoy. You may also commission any one of our artists to do a personal piece for you or a loved one. 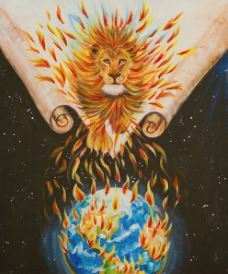 Prophetics Gallery also conducts training seminars and programs on prophetic art. They also travel to churches and communities to set up galleries or temporary display of prophetic art. Please contact us at 1-844-559-9500 or email at PropheticsGallery@gmail.com should you wish to discuss a project or set up an prophetic art event in your area. 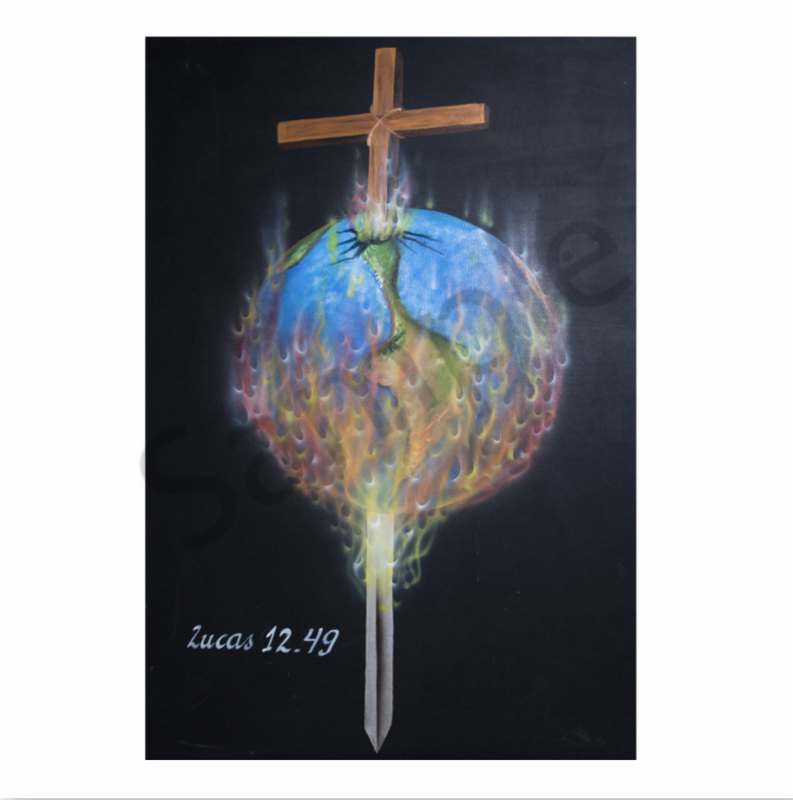 BUY THE GIFT OF PROPHETIC ART! Please visit our website to select from over 53 additional artists from 11 countries including Australia, the Cayman Islands, Kenya, the Netherlands, New Zealand, Sir Lanka, South Africa, United Kingdom, Argentina, Canada, and the USA. We have over 400+ pieces of art, photography, sculptures, jewelry, apparel and more. our gallery. 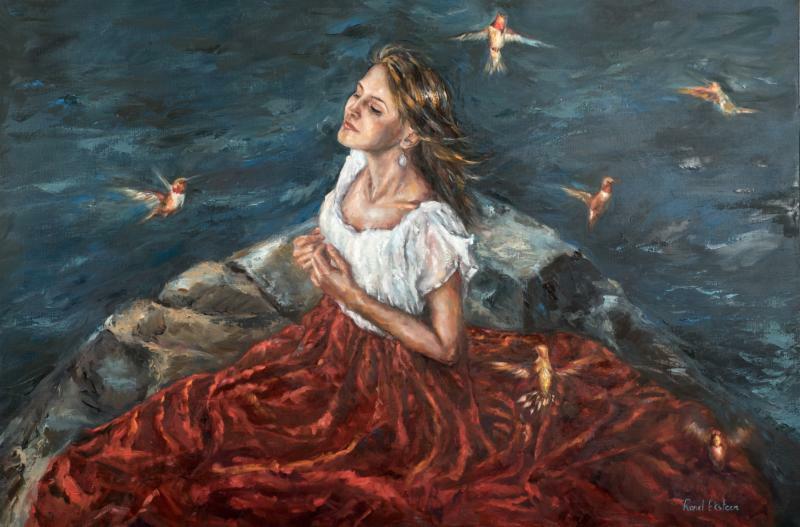 Her paintings impart peace, love, courage and enlightenment that flow from the Holy Spirit. how her art has changed atmospheres and hearts of many around the world. her entire collection with our gallery and purchase a print or giclee. Link To Ana Mendez Ferrell's Artist Page! gallery. He is a student of the visual arts from Universidad Nacional de Artes in Buenos Aires. speaking to us all the time and especially through the work of His anointed artists. Emanuel works mainly with pencil and watercolors on paper creating magnificent illustrations. Please visit Emanuel's artist page by clicking on the link below. Link To Emanuel Encinas' Artist Page! 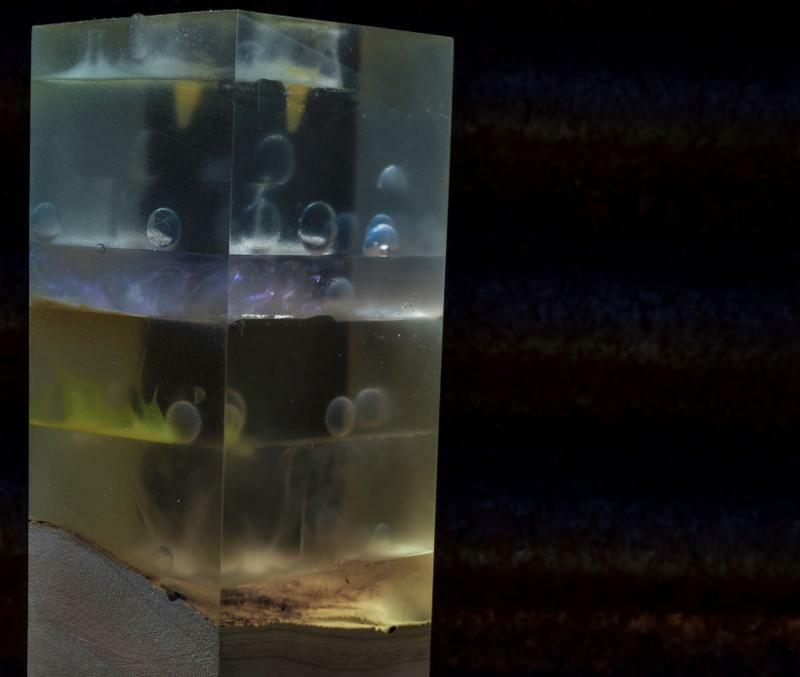 resins for a period of time to create a very unique lit sculpture piece like no other. collection. 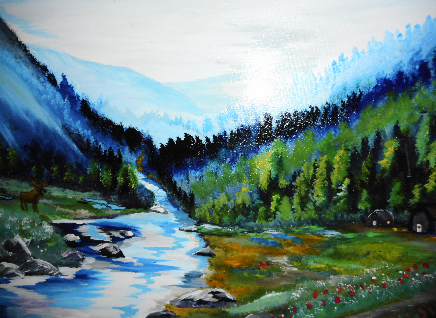 Click on the link below to view and purchase Larry's beautiful creations. Link To Larry Ortega's Artist Page! Creator by reflecting Him in her art. 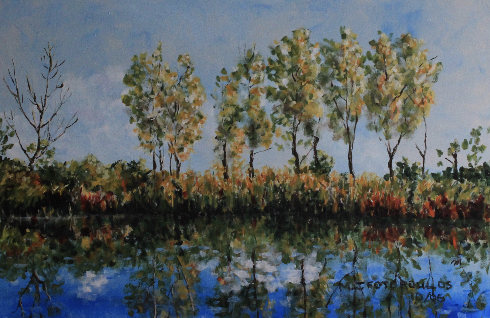 Please click on the link below to buy a beautiful print or giclee of Ronel's art. Link To Ronel Eksteen's Art Page! 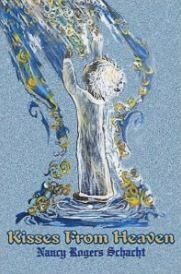 Prophetic Artist Kathy Brusnighan releases her book! gallery has had such an impact in changing lives and atmospheres. Please order one of Kathy's books from her most recent "Courage"
the proceeds of this book go to funding the traveling gallery each year. 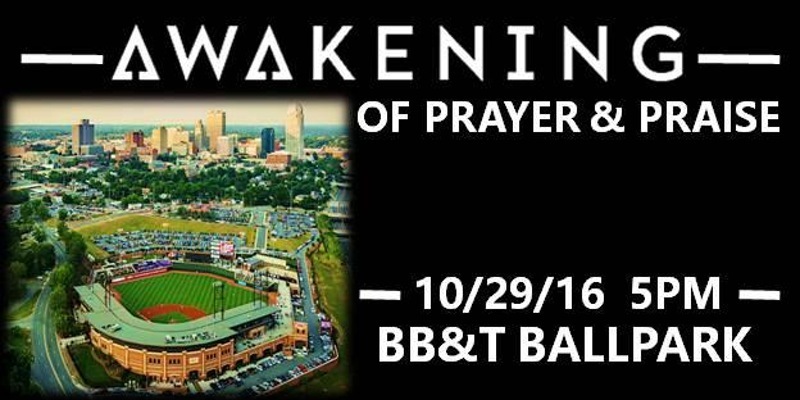 Come to the "Awakening of Prayer & Praise"
and love to your community. 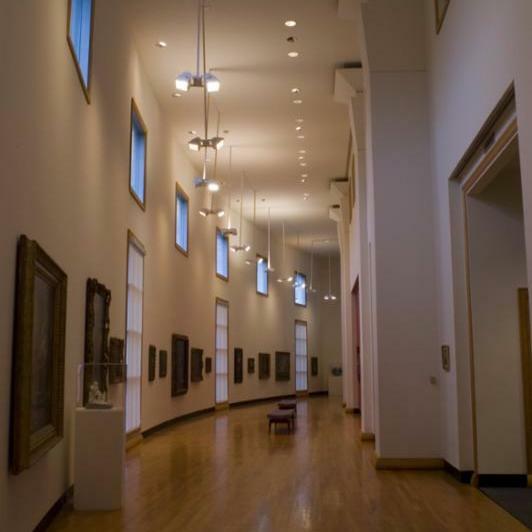 Call to schedule a touring gallery in your area today. Debbie Marino at 1-844-559-9500 or email her at Propheticsgallery@gmail.com. participating church once a month for the previous months 10% credits earned. artists from 10 countries including Australia, the Cayman Islands, Kenya, the Netherlands, New Zealand, Sir Lanka, South Africa, United Kingdom, Canada, and the USA. We have over 400+ pieces of art, photography, sculptures, jewelry, apparel and more. 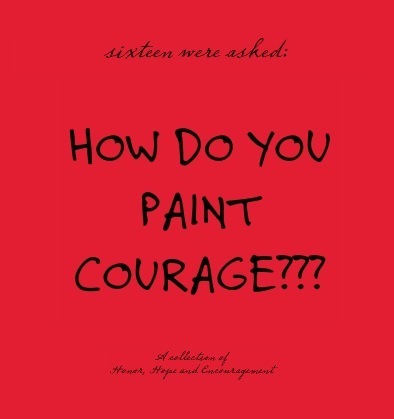 in North Carolina area for her innovative traveling gallery "How Do You Paint Courage". gallery and on our artist team. 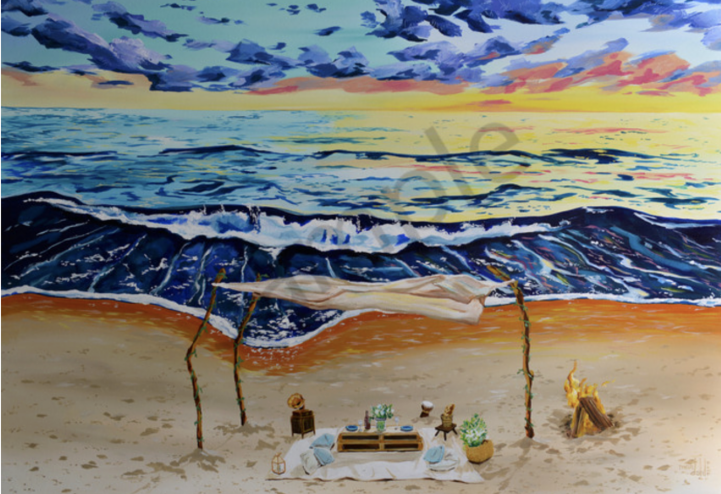 an original art piece or a print/giclee of her artwork. 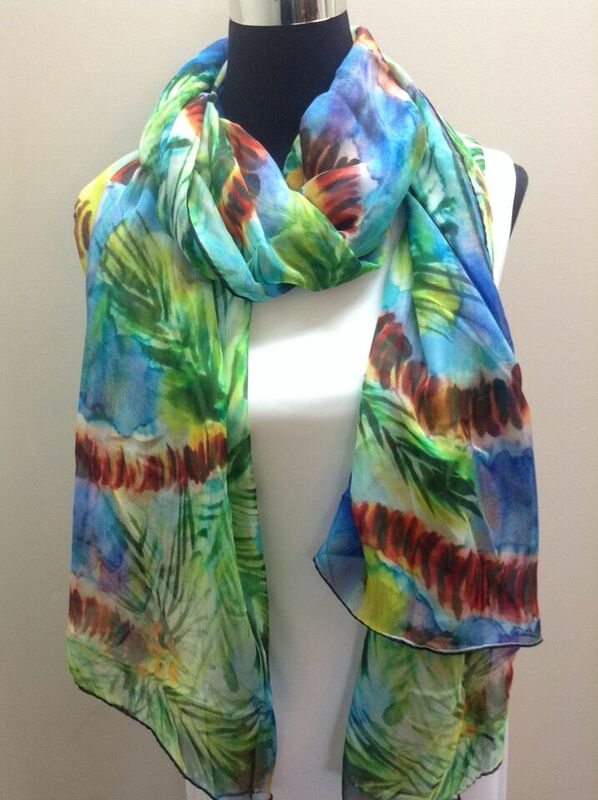 designs silk scarves and apparel for women as well as beautiful silk ties for men. and bring God's light. Her vision is for a Kingdom couture line that will simply love out loud. 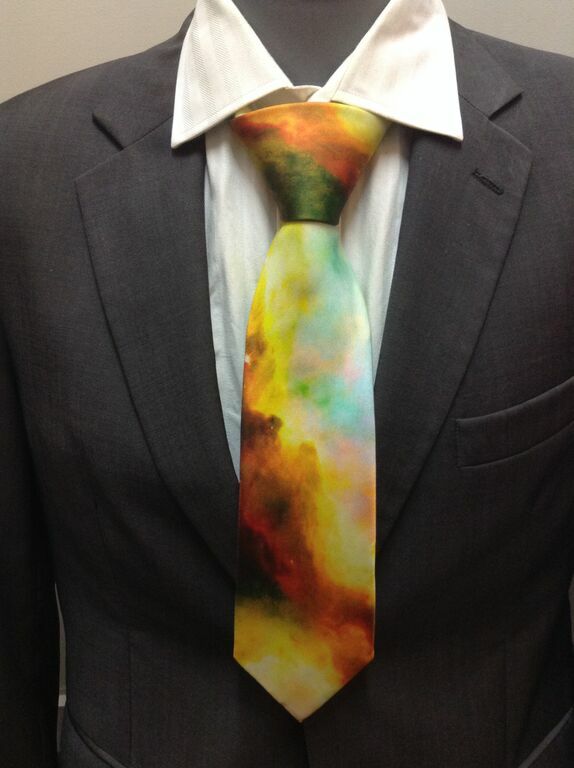 satin tie for that special man in your life. July 2015 when we first began our online gallery and we are honored to have her on our website. or a print/giclee of her artwork. bring healing and hope to many. 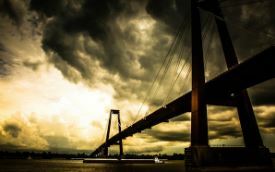 purchase a print of his amazing photography available in our online gallery. 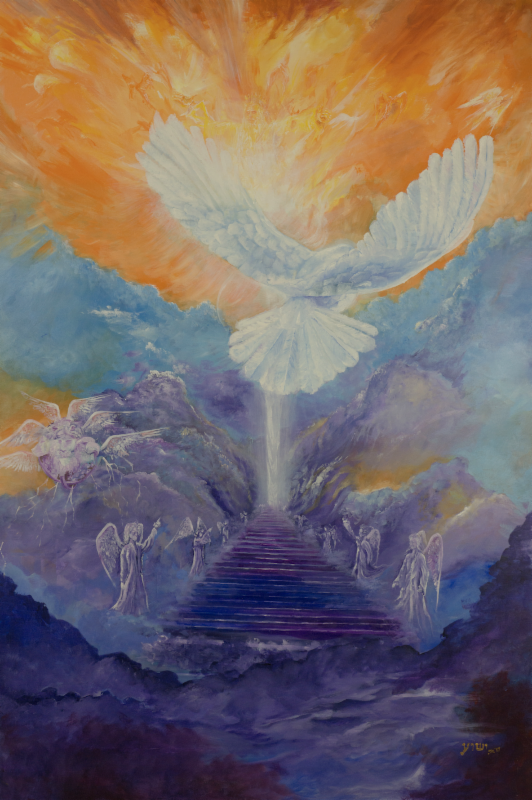 Prophetic Artist Mandy Adendorff releases her new book! 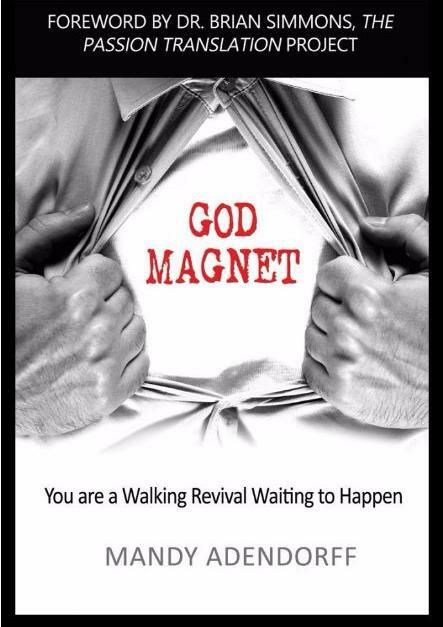 Recognize and activate who you have become ...a God Magnet, a walking Revival waiting to happen! Do you long for more of God's presence? Do you desire a greater revelation of His love for you? Are you wanting to hear His voice more clearly in your life? Your journey as a believer is about to get a turbo-boost as you discover that you are an irresistible God magnet. Come visit us at the Christians In Action Trade Show (CIATS) in Florida! Hricinak-Sheets who is one of our fine prophetic artists from North Carolina. Trade Show Link click here! Also, please visit our website to select from over 46 additional artists from 10 countries including Australia, the Cayman Islands, Kenya, the Netherlands, New Zealand, Sir Lanka, South Africa, United Kingdom, Canada, and the USA. We have over 400 pieces of art, photography, sculptures, jewelry, apparel and more. June Corstorphine recently joined our artist team and is from North Vancouver, British Columbia in Canada. 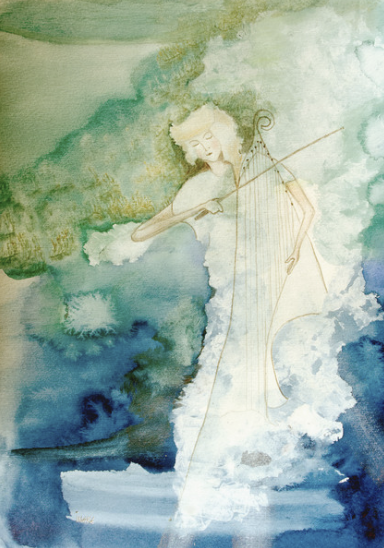 Her inspiration is drawn from many sources including nature, ancient times, instrumental music, and contemporary design. Much of her time is spent contemplating God's glory and majesty in nature which provides insight and inspiration. 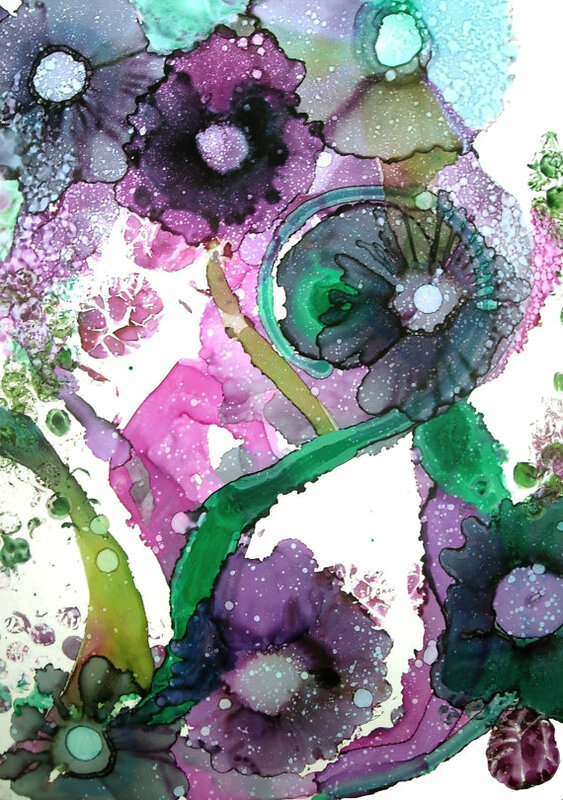 June works with alcohol ink and also creates handmade paper art. We welcome you to visit our website to view June's entire collection and purchase a print or original of her artwork. Mandy Gero joined our gallery this month and is from Northhampton, Pennsylvania. Mandy feels that the Holy Trinity is her inspiration and the essence of God's presence in and among our humanity. She creates in an effort to bring healing and mercy forth from God. 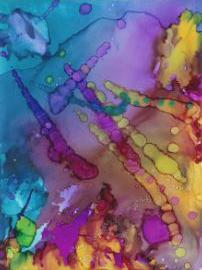 Mandy mainly works with alcohol ink and anointing oils when creating her art. Mandy has degrees in the Humanities, Philosophy, Theology and the Arts from Northampton Community College and DeSales University. 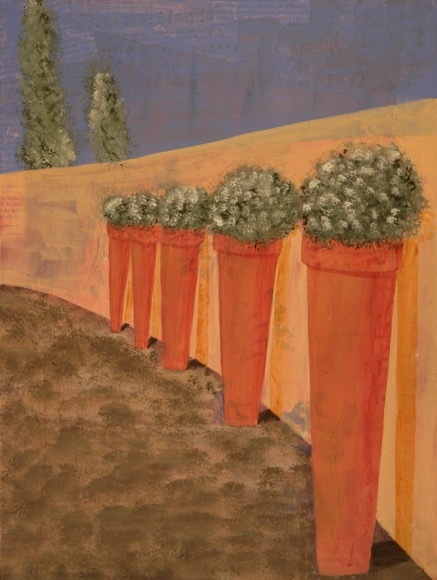 We welcome you to visit our website to view Mandy's entire collection and purchase a print or original of her artwork. Patricia Jessee is from Kansas City, Missouri and gets her inspiration from her relationship with God. 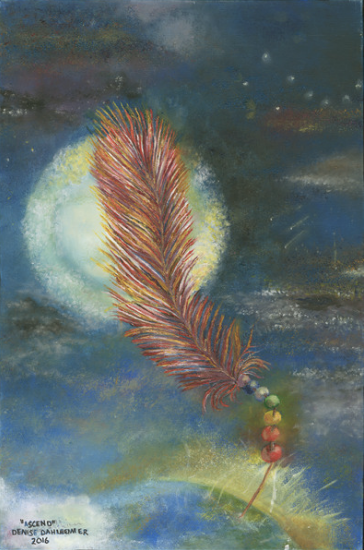 Most of her paintings come from dreams or visions. She wants people to see who Jesus really is by the metaphors she paints of a loving, relational and forgiving Savior. She mainly paints with oil, acrylic, and pastels. 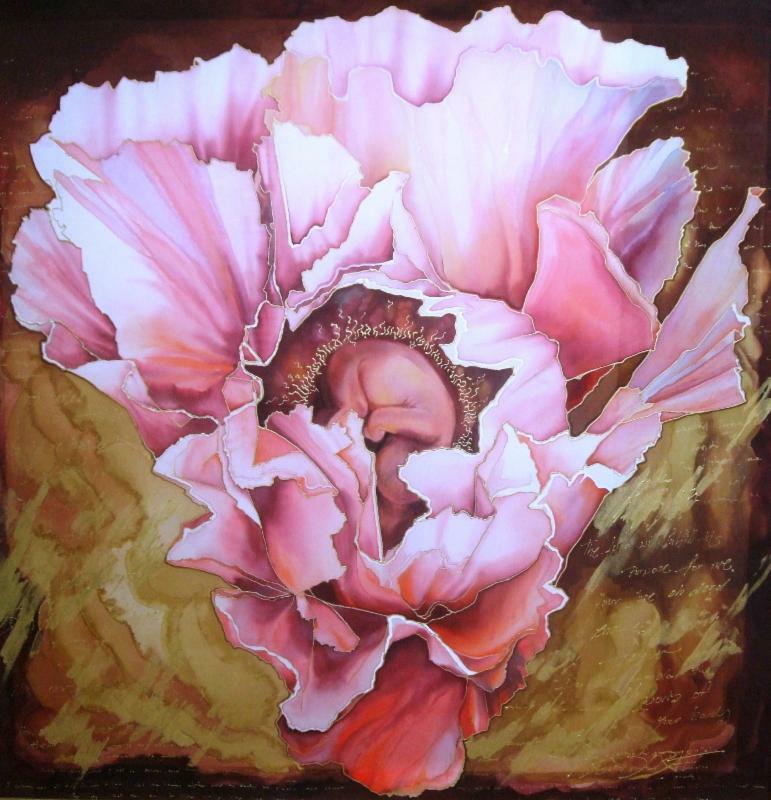 Patricia is a Art Education graduate from Kansas University and also studied at the Kansas City Art Institute. She has had her art in various galleries and art shows in Missouri and Kansas. We welcome you to visit our website to view Patricia's entire collection and purchase a print or original of her artwork. 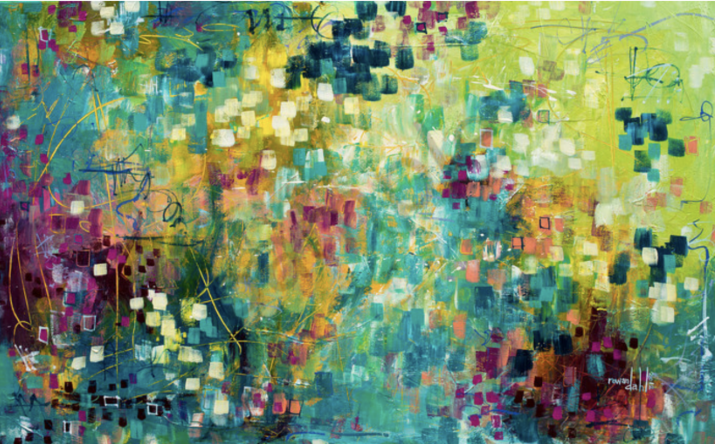 Jodi Murphy is from Dening, New Mexico and paints with a brush or palette knife. She lets herself go into a spiritual and peaceful state of mind to allow the Holy Spirit to guide her creative hand. After a life threatening experience, she has been creating art that is divinely inspired through prayer, worship, vision or dreams that she hopes conveys a message that God wants to bring to His people. Jodi has shown her work extensively in various galleries and art shows in Arizona, New Mexico, Texas, Georgia, and Tennessee and is a graduate of Chattanooga State Technical Institute in Tennessee. 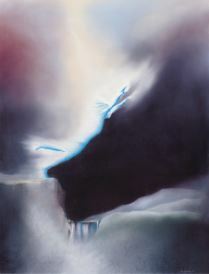 She has studied under several artists such as Barbara Wright and Bill Gallen. 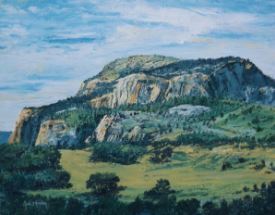 She is a member of the Plein Air Painters of New Mexico. We welcome you to visit our website to view Jodi's entire collection and purchase a print or original of her artwork. Prophetics Gallery now offers a way to earn a 10% credit for your local churchon all purchases that you make from our gallery. Let your pastor or minister know about our program and have him/her complete our "Church 10% Credit Code Sign Up Form". This form is available by clicking the link below or going to the bottom of our main page on our website and clicking on the "Church 10% Credit Sign Up Form". 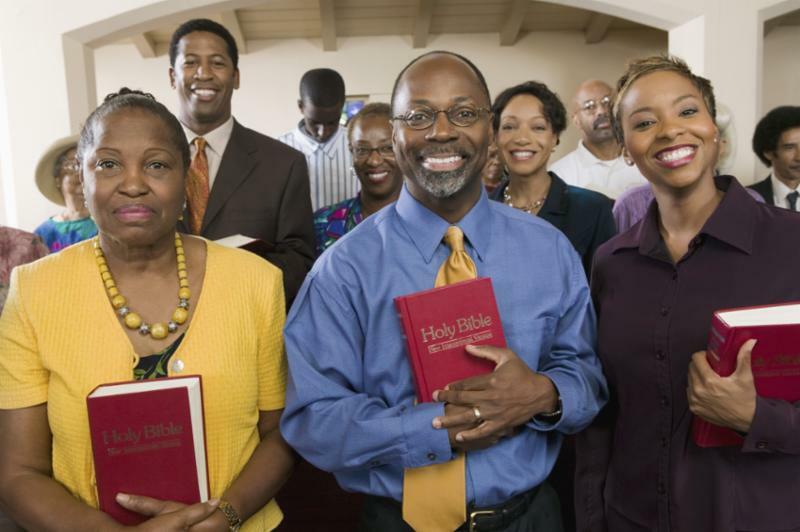 We will then assign the church pastor or minister a code that can be used by their church members and friends when ordering products from us. These churches will receive a 10% credit on the total of the gross sale for orders designated with their assigned code. 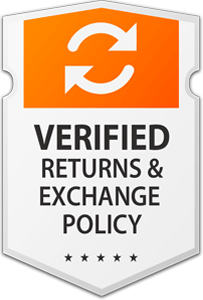 This code can then be used in the final check out process on our website when purchasing products by putting the code in the "message" box section. Once the code is typed in the message box, we will be alerted to it and will donate 10% of the gross sale to the church assigned that code. All assigned code information will be given directly to each pastor or minister who participates in our 10% credit program. 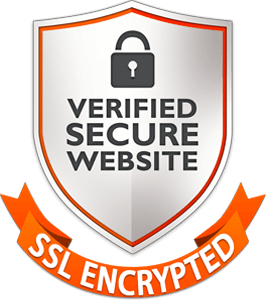 It will be up to the pastors or ministers to announce the code information to their church members or friends. The church will then receive 10% of the total gross sales of all orders identified with the assigned code. Checks will be issued to each participating church once a month for the previous months 10% credits earned. If you have any questions on how our program works, please contact Debbie Marino at 1-844-559-9500 toll free or by email at propheticsgallery@gmail.com. Prophetics Gallery and their artists are eager to help your local community and church organizations with art training workshops and traveling galleries. Also, if you need help with designing a permanent gallery space we have interior design experts that can help and supply artwork that you may need for your gallery. If you have artists within your community we would love to connect with them. We are always looking to add new talented fine artists, artisans, and craftsmen to our online international e-commerce gallery. Art has a way of bringing hope, encouragement, and healing to so many people. It is a visual connection that goes beyond words and has been a wonderful way in which we can connect and communicate with people of all languages. There is no better way to communicate then by arranging a gallery to come to your area to encourage the arts in your community. Several of our artists over the past year have arranged traveling galleries that tour local hospitals, cancer centers, church groups, art galleries, and business centers to bring an awareness for the need of hope, encouragement, and love. These artists decide on a particular theme such as "hope" for example and then gather various artists to paint "what hope looks like". 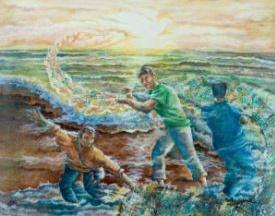 They give inspiring word descriptions to their paintings that depict this theme of "hope". Many in the community have been encouraged by this art gallery program. These traveling themed galleries created by our artists also caught the attention of countless individuals and communities through social media and local TV news stations. The traveling galleries that we offer are a wonderful way to bring awareness and change to many cultures worldwide. Let the visual Christian and Prophetic arts come to your area and bring hope, encouragement, and love to your community. Call to schedule a touring gallery in your area today. If you are interested in knowing more about our gallery programs, please contact Debbie Marino at 1-844-559-9500 or email her at Propheticsgallery@gmail.com. Happy Father's Day to all fathers everywhere! We have great Father's Day gift ideas! Father's Day is June 19th and no better way to say you love him then with a gift of art. It is something he will always cherish for years to come. We have some great selections and make sure you visit our website for more if you don't find something in our newsletter. 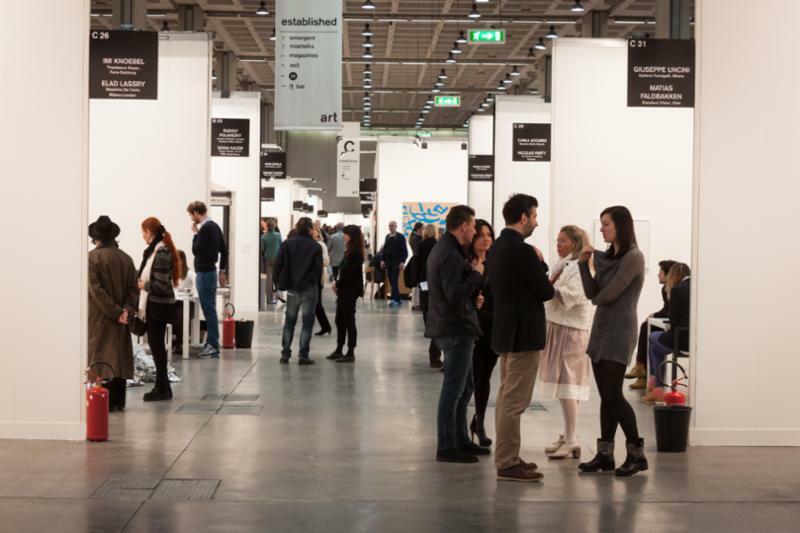 We have over 350 art selections with 38 artists from around the world so there is something for everyone. 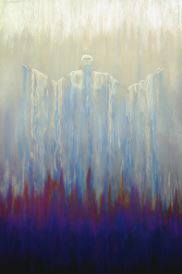 Enjoy our newest prophetic fine artist member and his art collection in our gallery. It is art of the highest kind! Mike is from Des Moines, Washington. He paints mainly with oil and mixed media. Mike has been called by God to paint and has been taught with the help of the Holy Spirit. He has been in many exhibits, museums, juried art shows and galleries worldwide. 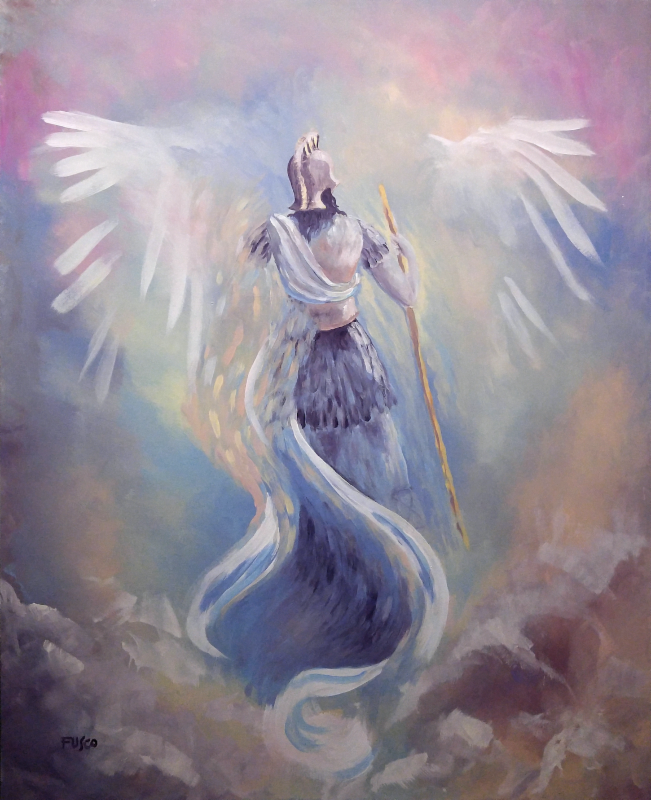 Mike's painting entitled "Psalm 91" is a depiction of God's protection and safety. 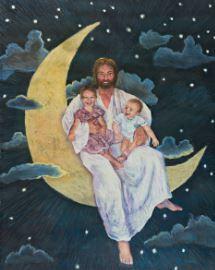 He uses children to display childlike faith in God's safety. 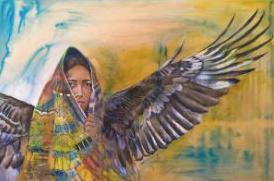 As you look closely at this painting Psalm 91 comes alive in visual form to display God's love and protection for His children. July is cool savings month!! a 20% discount on all "original" artwork with our gallery. The code is "JULY20" to receive your discount. Please note this discount does not apply to prints or giclees. 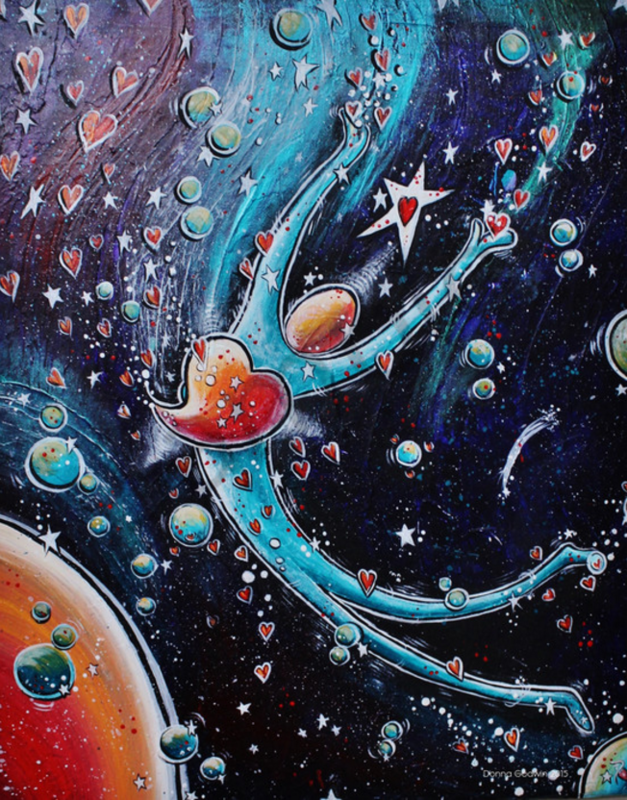 "On The Edge Of Space And Time"
Karen recently joined our artist team and is from Wheatland, CA. She gets most of her inspiration from the Word of God and has been painting and sculpting her spiritual ideas for 20 years. Karen earned a BA in art from the University of California in Davis. 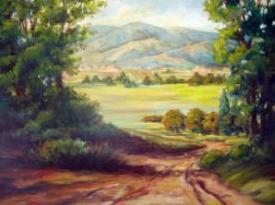 She has worked with various galleries in the Sacramento regional area. One of Karen's art pieces was selected to show in a permanent collection at the San Francisco Museum of Modern Art in 1971. We welcome you to visit our website to view Karen's entire collection and purchase a print or original of her work. Retha is from Krugersdorp, Jahannesburg in South Africa and gets her inspiration from God and His creation. She mainly paints with oil, acrylic, pastels, mixed media and watercolor. She studied at a local art college at Rhonzwa Art School. 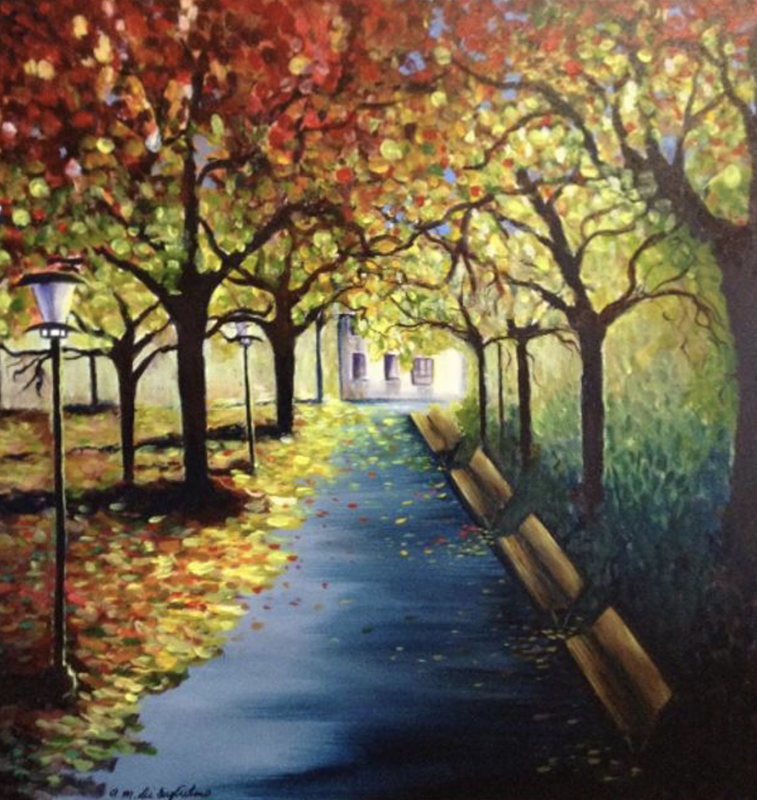 Retha gives private art lessons and does commission artwork by request. She is also an accomplished graphic designer. 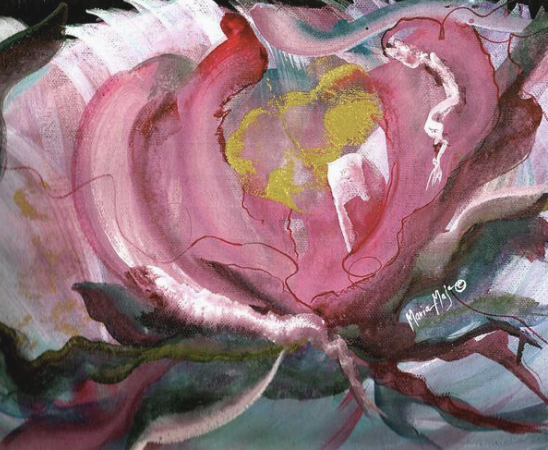 We welcome you to visit our website to view Retha's entire collection and purchase a print or original of her work. 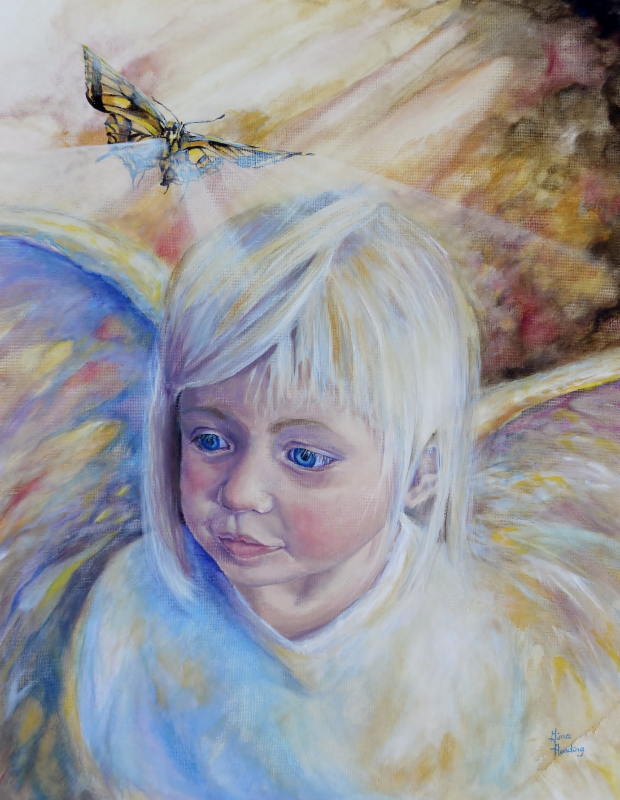 Nancy Schacht an artist at Prophetics just recently published a children's book entitled "Kisses From Heaven". 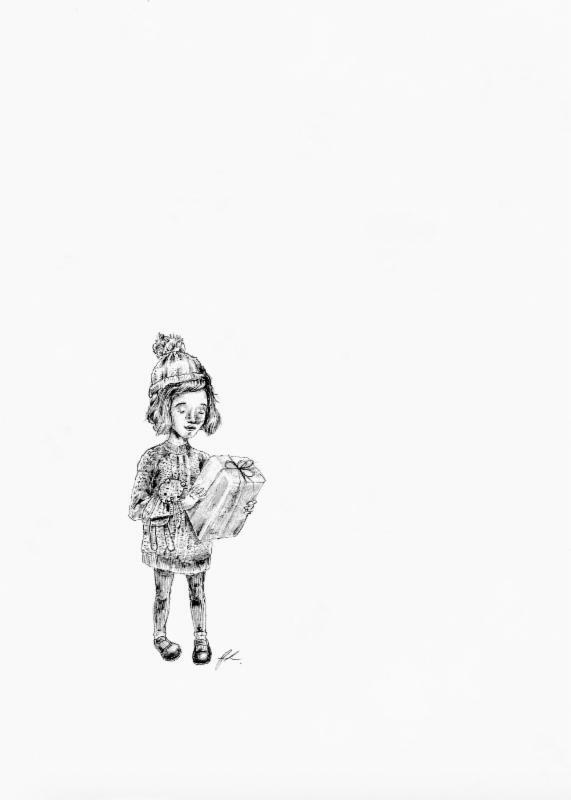 The illustrations in her book are all created by her and are depictions from her childhood. This book is now exclusively available on our website in which you will receive a hand signed copy of her book along with a art bookmark designed by Nancy. You can click on the link below and it will take you to our website to order this incredible new book. Prophetics Gallery now offers a way to earn a 10% credit for your local church on all purchases that you make from our gallery. Let your pastor or minister know about our program and have him/her complete our "Church 10% Credit Code Sign Up Form". This form is available by clicking the link below or going to the bottom of our main page on our website and clicking on the "Church 10% Credit Sign Up Form". We will then assign the church pastor or minister that signs up a code that their church members and friends can use when they order products from us. These churches will receive a 10% credit on the total of the gross sale for orders designated with their assigned code. This code can then be used in the final check out process on our website when purchasing products by putting the code in the "message" box section. Once the code is typed in the message box, we will be alerted to it and will donate 10% of the gross sale to the church assigned that code. All assigned code information will be given to directly to each pastor or minister who participates in our 10% credit program. It will be up to these pastors or ministers to announce the code information to their church members or friends. The church will then receive 10% of the total gross sales of all orders identified with the assigned code. Checks will be issued to each participating church once a month for the previous months 10% credits earned. This is an awesome way to give back to your church! Art Workshops and Visiting Gallery Just For You! Prophetics Gallery and their artists are eager to help your local community and church organizations with art training workshops and traveling temporary galleries. If you need help with designing a permanent gallery space we have an interior design expert that can help with this as well. Art has a way of bring God's hope and healing to so many people. It is a visual connection that goes beyond words and has been a wonderful way in which God communicates to His children. Let the visual Christian arts come to your area and bring God's love, light, and love to your community! If you are interested in knowing more about our programs, please contact Debbie Marino at 1-844-559-9500 or email her at Propheticsgallery@gmail.com. 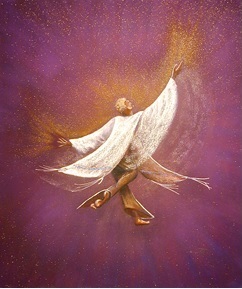 Enjoy our newest prophetic fine artist members and their art collections in our gallery. Mandy is an ordained pastor who was born in South Africa. She releases prophetic words over regions and people using paintings and combines this with speaking and activation ministry. Mandy has ministered for over 20 years creatively and works in private, church, and corporate collections internationally. She currently resides in Connecticut and is the director of the New England School of Supernatural Ministry and author of two books entitled "God Magnet" and "Remember To Leave Your Footprint". Her art piece "Bloom" was inspired by the millions of orphans in Africa which speaks of the unending love and promise of the Father on every child, known and forgotten. "Bloom" declares the call on every person to flourish in hope and bloom. It shows the developing child unaware yet surrounded by innumerable promises yet to be discovered. There are biblical promises written in gold metallic on the background of this piece. Camille Is from Hammond, Louisiana and attended the New Orleans Academy of Art. 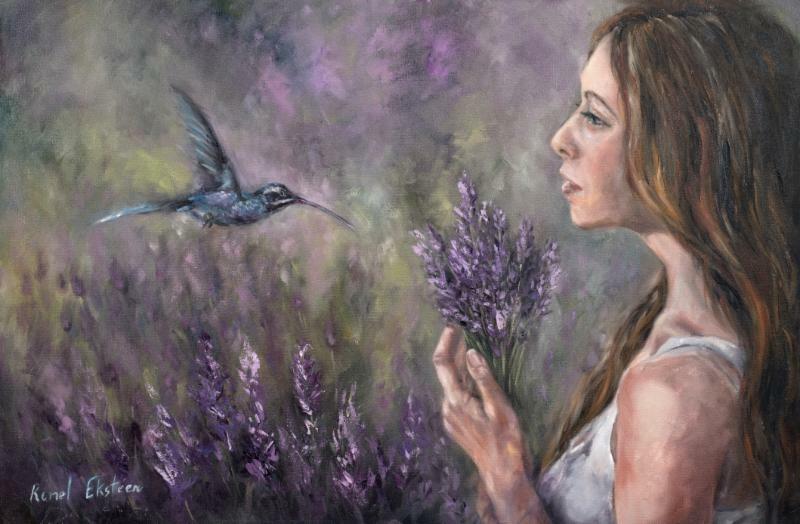 She paints landscapes, still life, portraits and inspirational works. 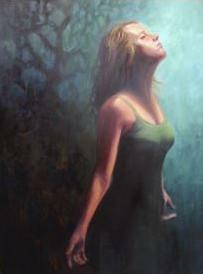 She has been in several galleries in Baton Rouge, New Orleans and Mandeville, Louisiana. 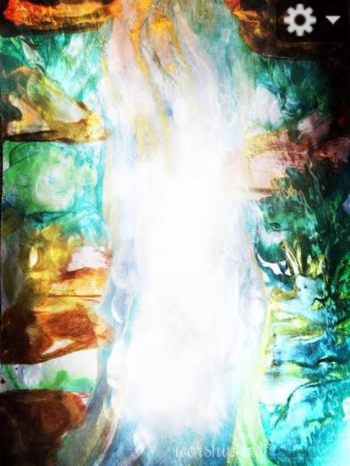 She describes heaven as a place of pure and intense worship and her oil painting "Son Soaker" depicts an imagined glimpse of an angel in heaven captivated with God's Glory and worshiping the Son of God, our Savior. Susan lives in Palo Cedro, California and attends Bethel Church in Redding. She has a background in interior design and in 2008 God anointed her to start painting. 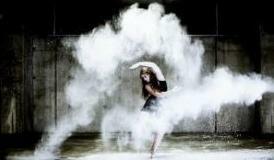 She is Holy Spirit taught and has no formal experience in the field of art. 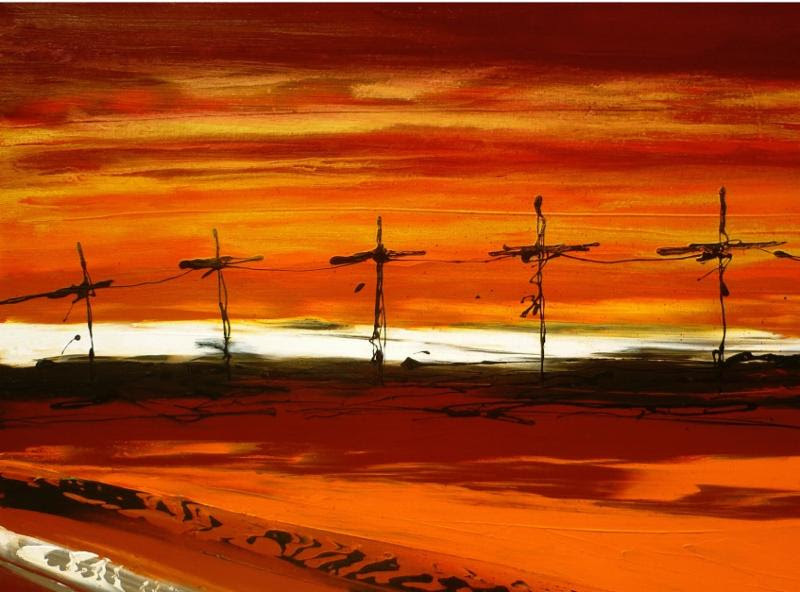 In 2011 she had many of her paintings permanently displayed at John Paul Jackson's Stream Ministries office building. "Redemption" she describes as a mirror to my soul in which I stand redeemed. I'm finally free to be my greatest self and live out my purpose with all power and authority." "She is clothed with strength and dignity, and she laughs without fear of the future (Proverbs 31:25)." Janis was born in Scotland and her family moved to South Africa when she was eight years old. She currently resides in the city of Durbanville. She studied art at Johannesburg Art School and also studied interior design at Inscape Design College. She is inspired with the magnitude and magnificence of our Creator and He gives her dreams and pictures to paint to encourage others. 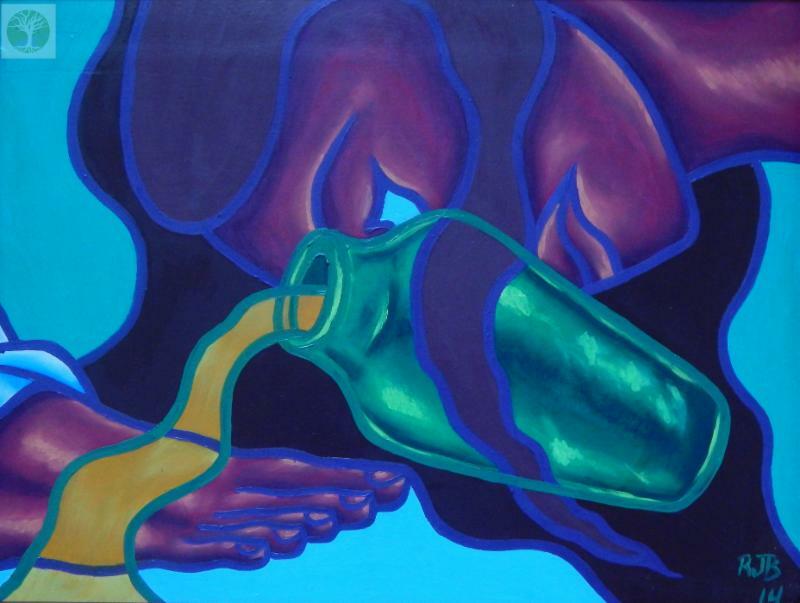 "United Family" is inspired by the Holy Spirit who gave her the word "vessels" which represent people. Much of this work as well as others in her collection contain patterns that represent the Holy Spirit , the cross, and fish and human figures. Ilse is from Brackenfell, South Africa. She was a police officer on the South African police force for 16 years and was inspired by God to paint. God opened a door for her to paint full-time and she has in several juried shows and competitions as well as in magazines and on TV. 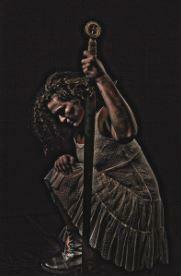 Her piece "Rebecca" was based on the biblical female figure Rebecca. 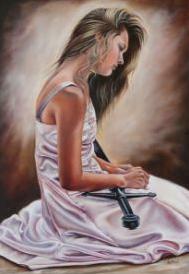 She refers to two scriptures in the bible to further describe the oil painting. One scripture is in 2 Corinthians 11:2 and the other is in Hosea 2:16-20. Rebecca is a warrior bride of Christ. John is from Danville, Virginia and started painting just over ten years ago with acrylic paints and also in digital art form with the use of a digital desktop pen pad. He is inspired when meditating or listening to the Word of God and listening to worship music. He has been taught to paint by the Holy Spirit and has no formal training. 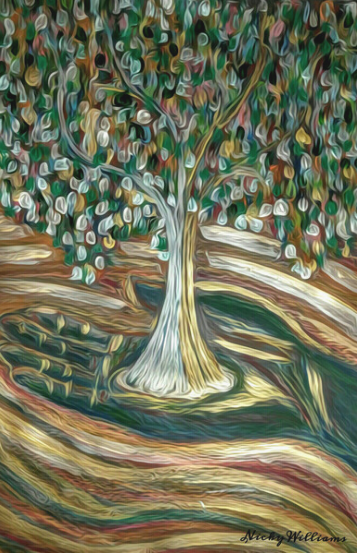 "Tree Of Forgiveness" is one of John's digital artworks. 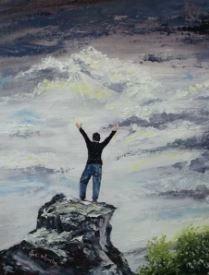 He describes this piece as just as Moses lifted up the serpent so must Jesus be lifted up. Also, Paul stated that Jesus became the curse by hanging on the tree that we may receive the blessing of Abraham. 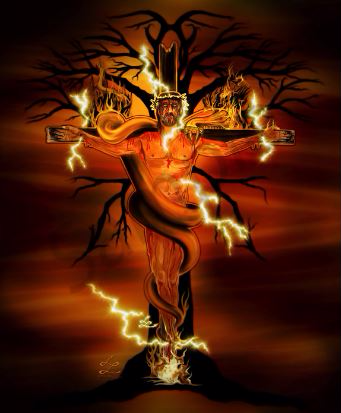 The serpent Satan used the tree in the garden to deceive Adam and Eve but Jesus came to redeem mankind and died hanging on a tree for our sins. Todd is from Houston, Texas has studied art growing up in Western Europe and enamored by the works of Michelangelo and Dali. 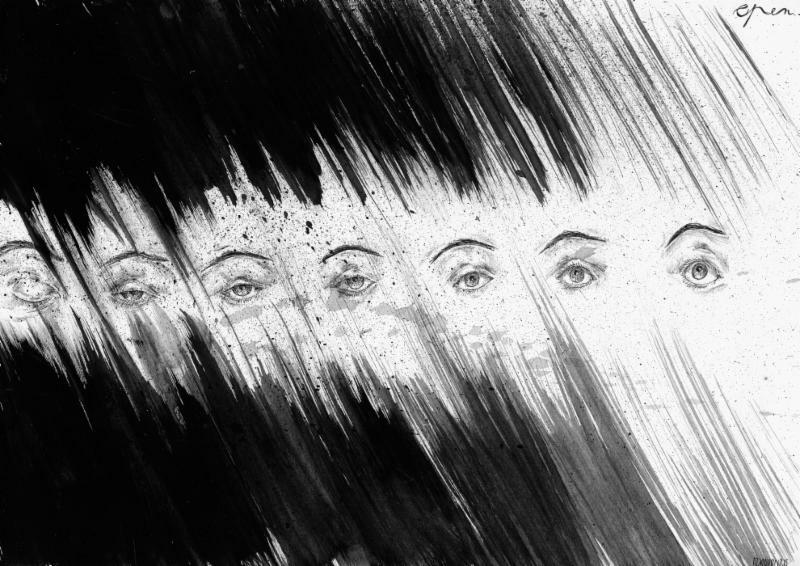 He had a severe accident 20 years ago and had to relearn his trade using digital art devices. He was taught classical art skills by artist Tom Motely and Surrealism from artist Jim Stover prior to his accident. 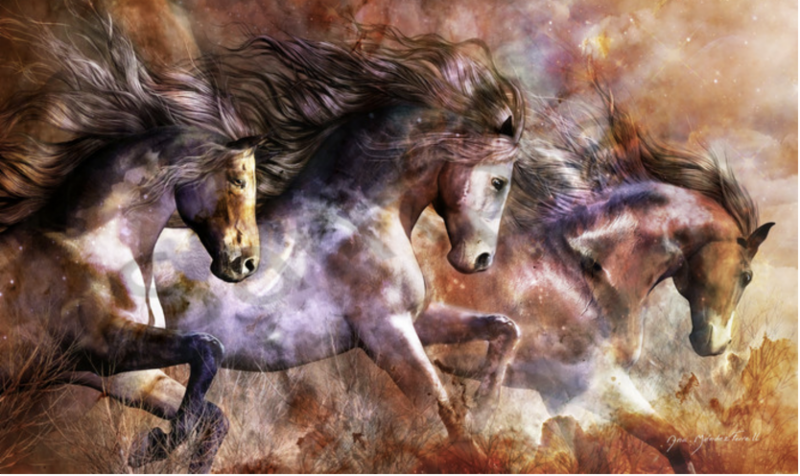 Todd has been given dreams and visions from God of heaven and paints these visions by using a digital drawing tablet. 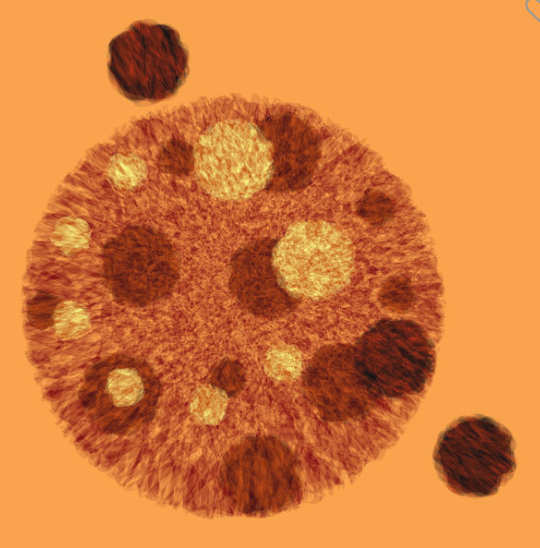 We like to call his art style Digital Fine Art here at Prophetics. Prophetics is coming to a community or church near you. 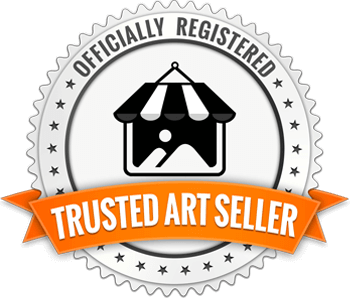 We have several teams that will be able to go into the local communities in your area to help present a traveling gallery of original art, prints, sculptures, apparel art and more. We also have teams of artists that can lead workshops on prophetic art or paint on stage at conferences. Prophetics has so many wonderful and dedicated artists that create art with a purpose. Their art has a "divine" purpose that brings God's love, hope and healing to many who are hurting. It is an excellent way to help change atmospheres, communities and cultures. 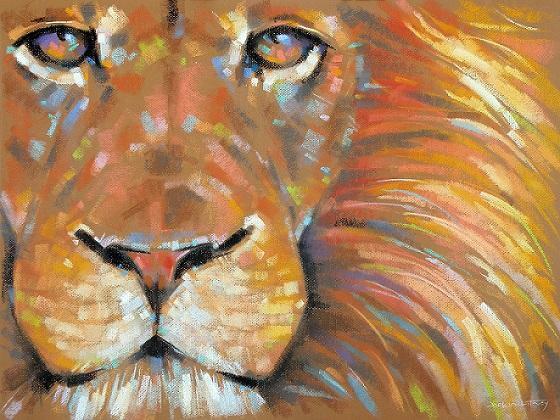 If you are interested in setting up a gallery, having a prophetic art workshop, or having an artist paint on stage in your area, please contact Debbie Marino at Propheticsgallery@gmail.com or call toll free at 1-844-559-9500. These programs are available worldwide! We are currently planning a program in Ireland for April 2017. More details to come for this trip and prophetic art program with Prophetics Gallery. Stay tuned! Buy The Gift Of Art For Someone Today! We have the finest Prophetic and Christian Artists and Artisans in the world! We also have art for every budget and offer originals, prints, framing, matting and ship worldwide. We also have sculptures, scarves, jewelry, apparel and more! Beautiful jewelry has been added to our e-commerce website. Please visit our website and enjoy purchasing the latest in prophetic jewelry. Each piece is handcrafted by a master artisan in the field. Mother's Day is just around the corner and this would be a magnificent way to show your love by purchasing jewelry for that special mom in your life. She deserves the very best! Jewelry artist Kathryn Lane Berkowitz (click on her name and it will take you to her Prophetics Gallery page) has a series of collections and they are available for immediate purchase. Please visit our website to see all her collections of beautifully handcrafted bracelets, arm cuffs, neck cuffs, and necklaces. 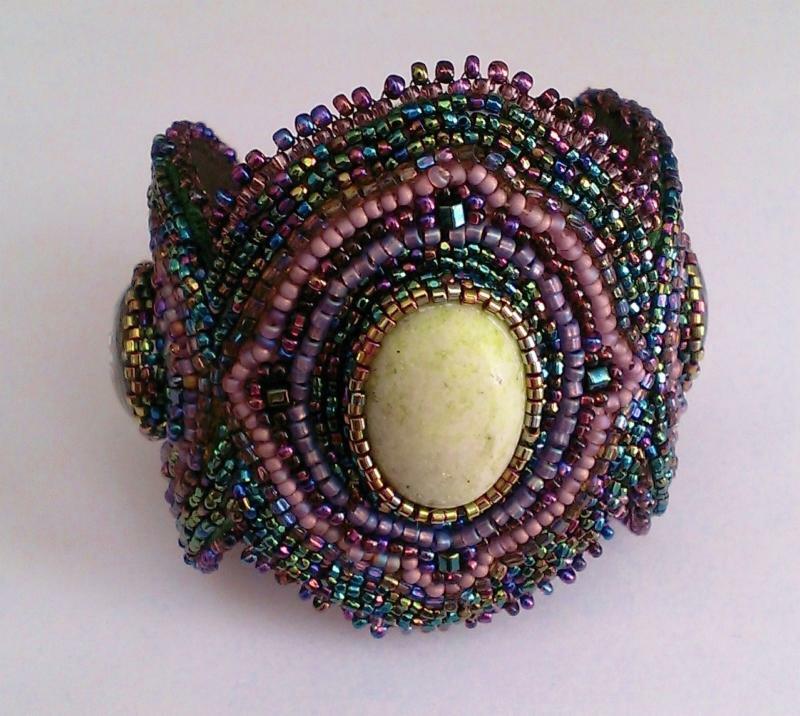 Kathryn is from Lincolnton, North Carolina and creates handcrafted jewelry with seed beads, gemstones, crystals, and other elements to create her jewelry. Click on our link below to send you directly to our website for our prophetic jewelry collection. 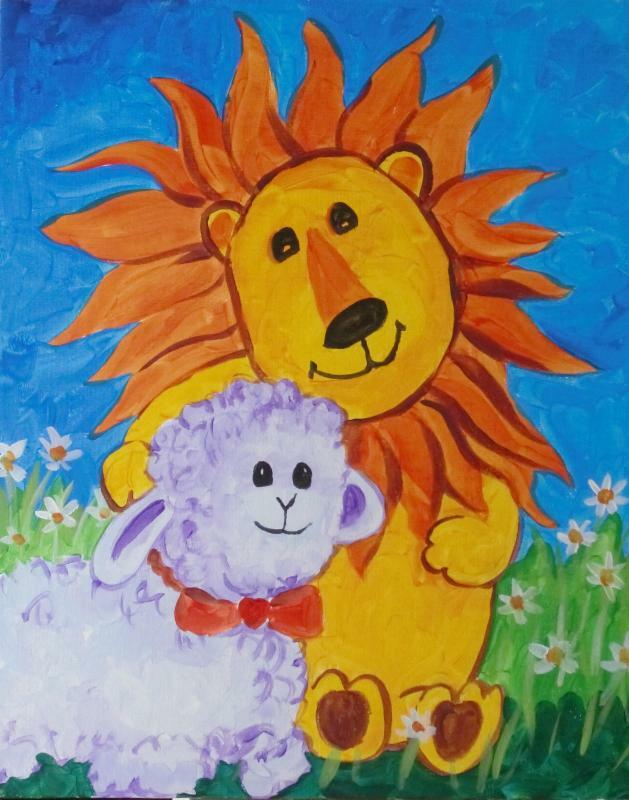 We have had recent interest in bringing great new collections of art for children's rooms and nurseries. So a new category for Children's Wall Art was added to supply that need. We hope you like it and we will be adding more artists to fill this special niche in the days ahead. Jean Pierre DeBernay has several art pieces for a children's bedrooms or nurseries and they are adorable! 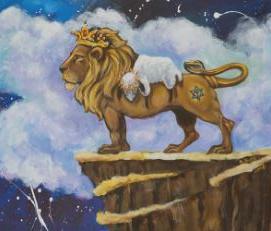 Please visit our new selections of Children's Wall Art today and enjoy the beauty of prophetic art for your children. They are heavenly atmosphere changers! 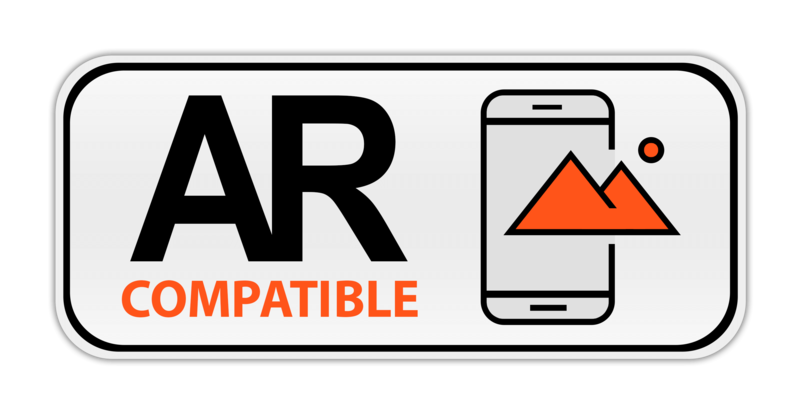 Click on our link in orange below. If you are interested in setting up a gallery, having a prophetic workshop, or having an artist paint on stage in your area, please contact Debbie Marino at Propheticsgallery@gmail.com or call toll free at 1-844-559-9500. Art With A Divine Purpose! 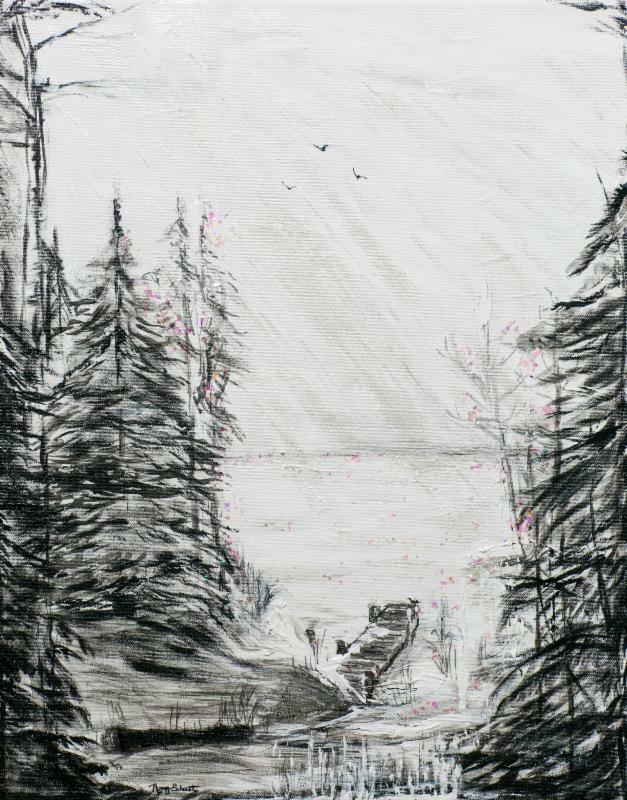 David is from Freeport, Maine and is a studio artist and he works primarily in pastels. David's formal training is from the San Francisco Art Institute, the San Francisco Art Academy, and the Carmel Art Institute in California. David's inspiration comes from the world around him but much is from within. He is a fan of beauty and he paints from the beauty that surrounds us. When creating a piece of art, he draws from what he sees in nature and from the heart. He is a student of the language of color and light and expresses the impact of longings of the human spirit through this silent voice. 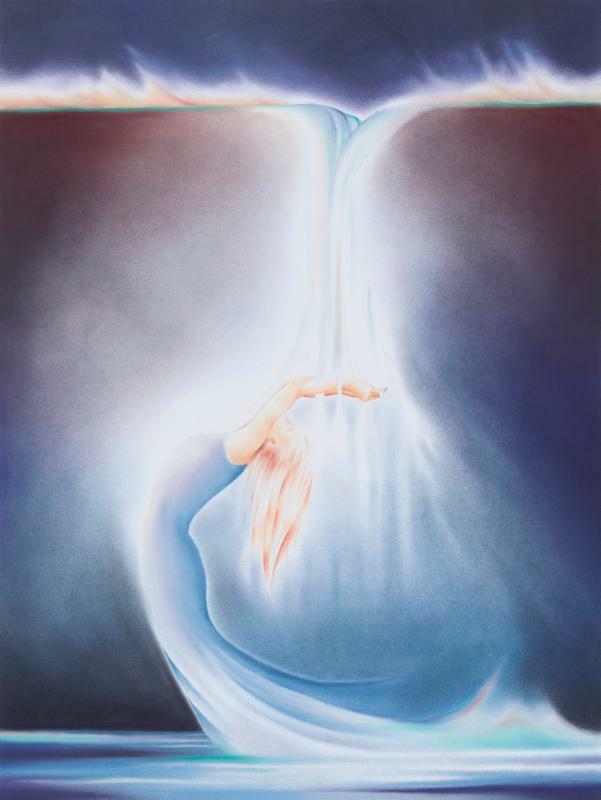 The prophetic meaning behind David's art piece "Holy Ecstasy" is that the image depicts one who thirsts for living waters and the promise fulfilled. Click on David's link below to see his entire art collection on our website. Jean Pierre lives Colorado Springs, Colorado but was born and raised in Normandy, France. 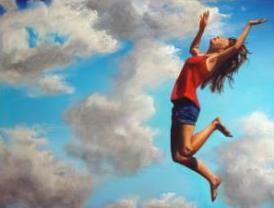 He received his Art degree from Penn State University and did his post graduate work at Kansas City Art Institute. He has worked for Hallmark Cards and Current Inc. a greeting card company. 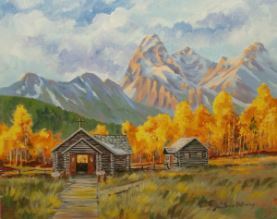 Jean Pierre has an art ministry at Eastside Church in Colorado Springs and has several galleries representing his work on the East Coast, Santa Fe, and Sedona. Jean Pierre is inspired by the Holy Spirit and scriptures. His talent comes from the Lord and he gives Him all the credit. 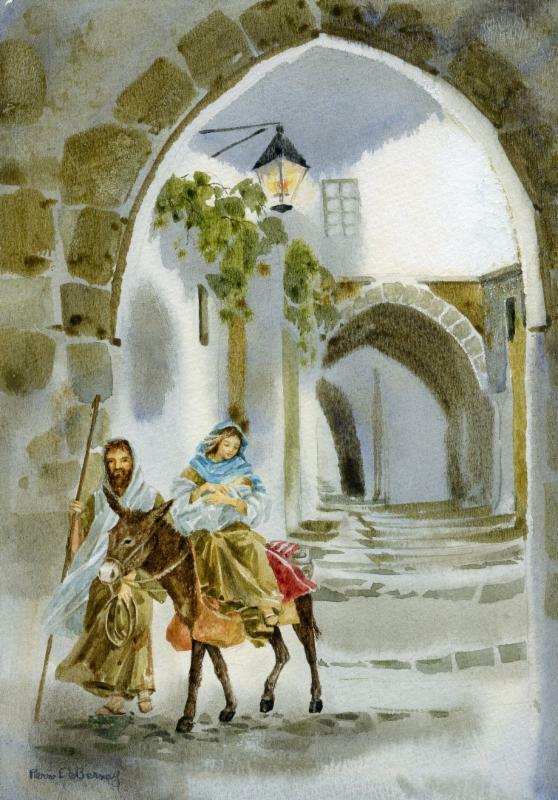 He uses impressionism and realism in creating his work in watercolor or oil. 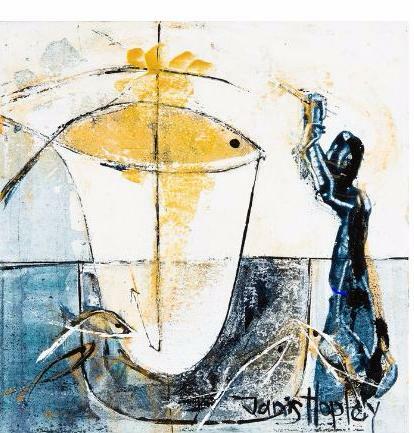 Click on Jean Pierre's link below to see his entire art collection on our website. Maria is from Wiltshire in the United Kingdom. Maria is mainly self taught but has had training through a local college. Her inspiration comes from her relationship with God. She expresses her heart through painting as God has designed her to do. The prophetic word for "My Beloved" is that is how God feels about us. He made us to be vibrant and settled in the knowledge that we are His. The strong orange and green remind her of this along with the purity of white. The golden cross is a symbol of God's passionate love and how He feels. 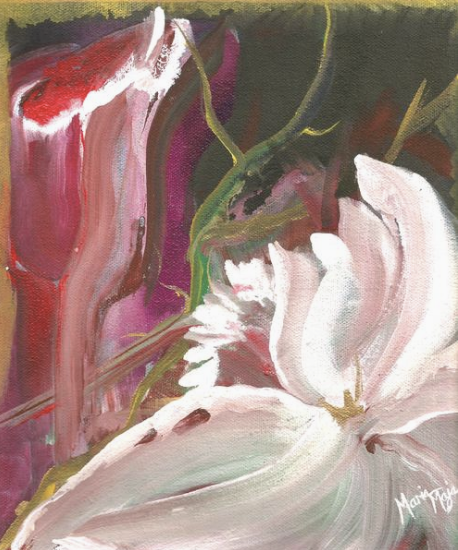 Click on Maria's link below to see her entire art collection on our website. 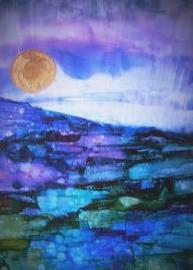 Alice Arlene Briggs will be conducting Mixed Media classes online which will be ongoing. You can sign up and work at your own pace via video. 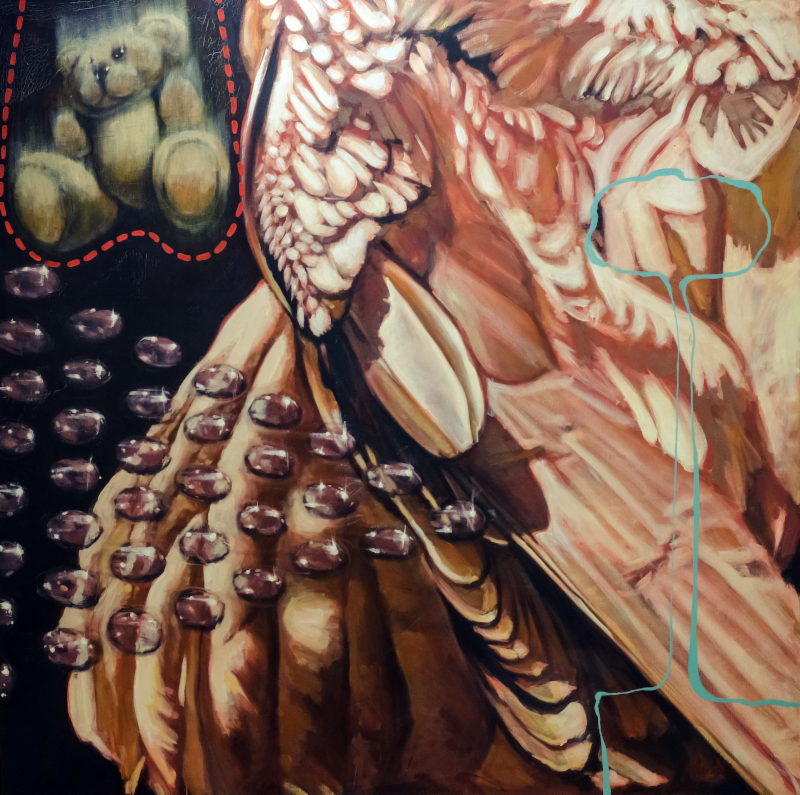 In six short sessions Alice will walk you through the creation of one of her mixed media pieces from start to finish. Visit Alice Arlene Brigg's website! 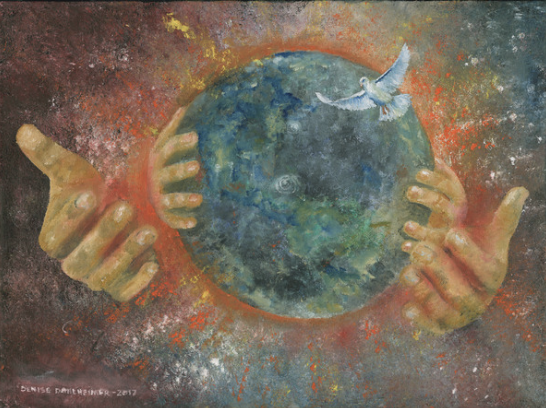 Our Prophetics artist Kevin Moffatt will be attending the Together International conference April 21-23 in Mechanicsburg, PA and will be painting on stage. Many amazing international guest speakers will be speaking at this conference so please attend if you can. Click on the link below in blue to register. Admission is free but you need to register. We launched a wonderful new campaign in February to spread the news about our gallery and added a free give-a-way for an art magnet with selections of beautiful artwork from some of our finest artists. We have continued this offer into March. This art magnet also includes all our contact information offering a way for you to stay in touch with our gallery. We have unique handcrafted Prophetic and Christian art that you will want to purchase and this magnet will come in handy by keeping it close by on your refrigerator. We are very proud of our team of fine artisans and craftsmen and love sharing that with you. Prophetics would also love for you or your friends to also take advantage of this free give-a-way by clicking on our "Contact Us/Join Our Email" on our website. Mention our free art magnet offer to your local churches, businesses or other organizations and have them link up to our website by clicking on "Link To Us". They will then be able to share this free offer within their community or organization and everyone can get their very own Prophetics art magnet. Recently one of our artists from Prophetics started a traveling art exhibit to several cancer centers located in the Cayman Islands. Avril Ward started a tour last October of centers with artists that painted "WHAT DOES HOPE LOOK LIKE?". We have other artists from our gallery that conduct wonderful programs as well. Cathy Schock and Kevin Moffatt travel in the USA to help train artists interested in prophetic art workshops. Also, Froyle Neideck from Australia traveled with a wonderful program she created and entitled "THE COLOURS OF HOPE". Grace Bailey is hosting a Prophetic Art workshop in Australia on April 1-2nd called "ARTS LEARNING MADE FUN WORKSHOP". 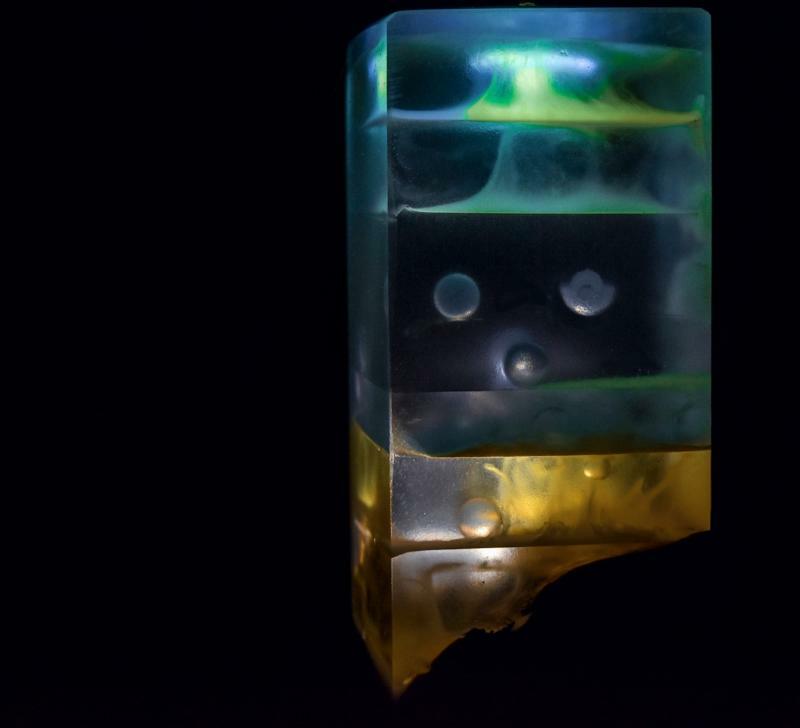 Click on the links below to learn more about these amazing workshops and traveling galleries. Prophetics has so many wonderful and dedicated artists that create art with a purpose. 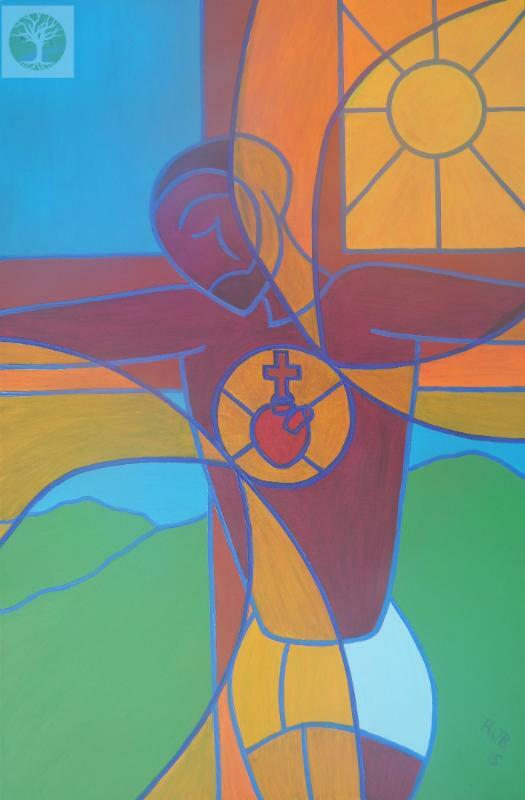 Their art has a "divine" purpose that brings God's love, hope and healing to many who are hurting. It is an excellent way to help change atmospheres, communities and cultures. If you would like for us to set up a similar program in your area, please contact Debbie Marino at Propheticsgallery@gmail.com or call toll free at 1-844-559-9500. Prophetics owner Debbie Marino and one of our fine artists Avril Ward from the Cayman Islands will be attending The Breath And The Clay at Awake Church in Winston-Salem, North Carolina March 4-6th. Ray Hughes and Gregory Wolfe are among several that will be speaking and teaching at this conference. This is a wonderful opportunity to attend prophetic workshops on art, dance, music and writing. Reserve your tickets as soon as possible and learn more about this event by clicking on the link. Also, Prophetics will be attending the CIATS (Christians In Action Trade Show) September 23-24th at the County Convention Center in Ft. Lauderdale, Florida. This is both a wholesale and retail trade show open to businesses and the public. Please come on out and visit us if you are in the area and stop by our showroom booth of beautiful Prophetic and Christian art from some of the finest artists in the world. We will be offering for purchase several selections of original art, prints, sculptures and more at the show. You don't want to miss this wonderful event! Here are some of our featured artists with Prophetics. Please visit our website to see their entire collection. Every art piece they create tells a story, gives a prophetic word or a Bible verse. Their art is inspired by God to bring light, hope, and love to many. We call this Art With A Divine Purpose! 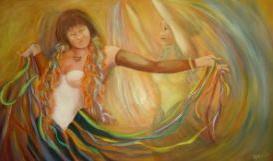 Cathy is an a prophetic artist from Ohio and paints with acrylic, oil, mixed media or pastel. She is a graduate of Bowling Green State University with a BFA degree. 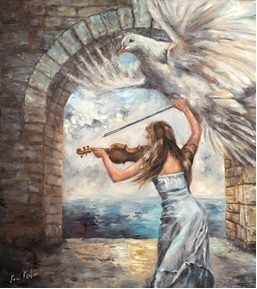 Her art reflects themes of hope, victory, and joy. She created "Art From The Heart International Ministries" with her business partner Anita Singh which encourages artists of all kinds to awaken to join and elevate in the Holy Spirit through the Arts. "Walking In The Glory Light" was based on 2 Corinthians 3:16-18, we can go from glory to glory with the King. As we submit hurts in our soul realm and learn to trust, we can walk another step in His Divinity toward the King of Glory. As the cub draws near to His Majesty, such compassion is expressed in the King's eyes towards the cub. 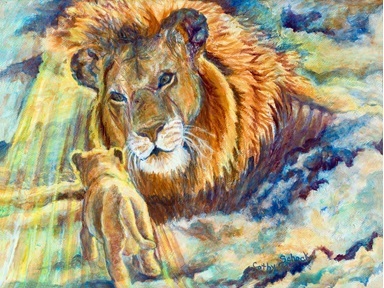 The Glory Light emanates off His mane and envelops the cub also in the process of walking towards Him (Psalm 24:3). Kevin is a pastel artist, teacher, mentor, and silk scarf painter. He is a BFA graduate from Maryland Art Institute. He travels to conferences and conducts seminars, workshops, and teaches about creativity. gave Kevin to paint for her. Please keep in mind that Kevin as well as all of our other artists are available for commission work should you desire a special art piece to commemorate a love one. Also, any art project that you would like for your home, office, commercial setting or church can be arranged with one of our artists by calling us at 1-844-559-9500 toll free or email us at Propheticsgallery@gmail.com. Nancy was born and raised in Iowa. 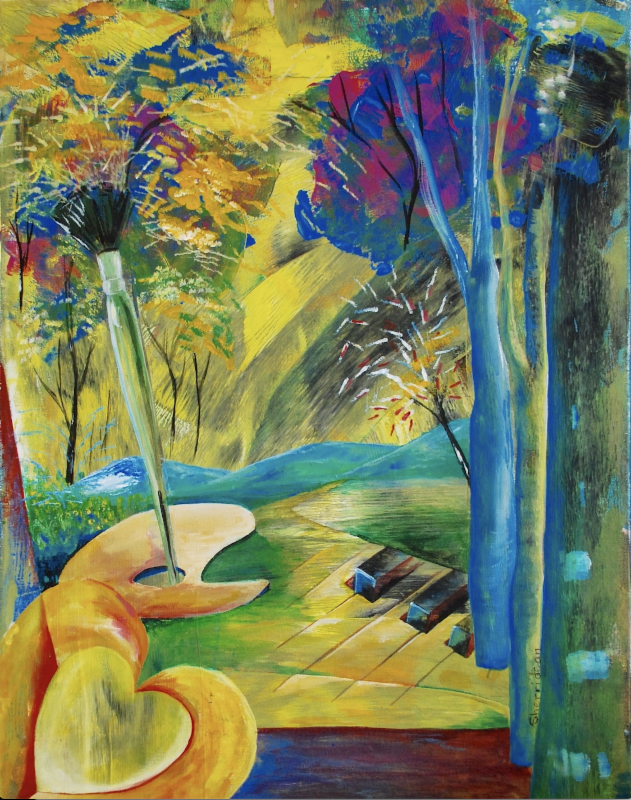 She enjoys painting as God leads her and experiments with new ideas that He gives her. Her desire is to impact the lives for the Kingdom. Nancy just released her first children's book called "Kisses From Heaven" which is a children's devotional. Many of the paintings that Nancy has in her book are based off her childhood growing up in the country. 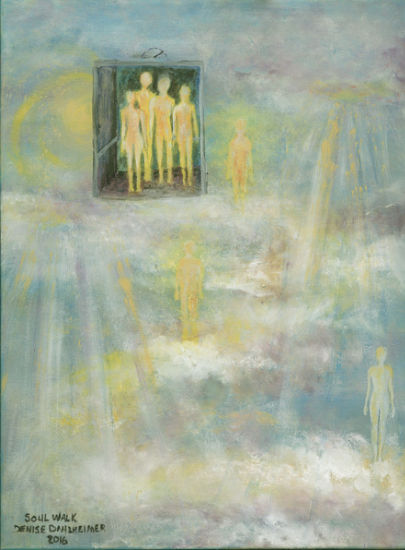 "Awaiting His Return" Is based off the Word in Revelations 22:12, "And, behold, I come quickly; and my reward is with me, to give every man according as his works shall be". Watching and waiting for Jesus is the theme. Ronel is a South African artist. She started as a Graphic artist and painted in her spare time. 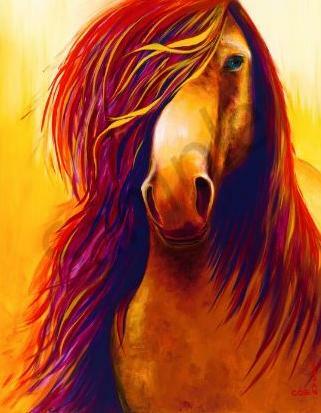 She paints with oils but had her start in acrylics. Her primary source of inspiration is her heavenly Father's love and beauty. She has a passion to release His love, light, and transforming power through her art. Ronel hosted an art exhibition in 2015 with fellow artist Marika Waterson called "Arise". "Arise" is based on the word Psalm 110:4. Maybe you do not believe that you are creative. Be reminded today that you are madein the image of our creative God. His Spirit lives inside of you and you have His creativity within you. Act on the burning desire to create and whether your creative expression is in music, writing, painting, sculpting, baking, photography or dance, let it be a reflection of your Heavenly Father. Be a beautiful display of His goodness and love. Do not compare yourself with others. The Heavenly Father placed a unique individual creative expression inside of you. Let it be an act of worship to Him. Encountering the heart of God through creativity will bring a divine exchange your ashes for His beauty. from Mombasa Polytechnic University College. He paints with oil or acrylic on canvas. He uses art as a basic form of worship. Robert believes that art has the powerto capture the attention, imagination, and the hearts of people. It is more effective in directing the nations than armies or weapons. 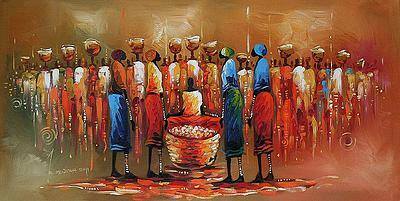 "Offering" is a painting that depicts offerings given to God the African way. Prophetics kicks off the New Year with advertising in Charisma and Spirit Led Woman magazines and in the Prophetic Insight online newsletter. We launched a wonderful new campaign to spread the news about our gallery and added a free give-a-way for an art magnet with selections of beautiful artwork from some of our finest artists. This magnet also includes all our contact information offering a way for you to stay in touch with our gallery. We have unique handcrafted Prophetic and Christian art that you will want to purchase and this magnet will come in handy by keeping it close by on your refrigerator. We are very proud of our team of fine artisans and craftsmen and love sharing that with you. Prophetics would also love for you or your friends to also take advantage of this free give-a-way by clicking on our "Contact Us/Join Our Email" on our website. Mention our free art magnet offer to your local churches, businesses or other organizations and have them link up to our website by clicking on "Link To Us". Then they can share this free offer within their community or organization and everyone can get their very own Prophetics art magnet. What a fun free Valentine's gift for everyone! Also, we welcome you to visit our website to purchase a wonderful art piece as a present for a loved one this Valentine's Day or for any occasion. It's an incredible way to show your love. Prophetics will be adding new products for the home and we have named this part of our gallery "Prophetic Home". You can expect to see many of our artists images reproduced on fabrics that will be used on pillows, drapery, upholstered goods and more. Stay tuned as we will inform you about these new exciting products in the coming months. 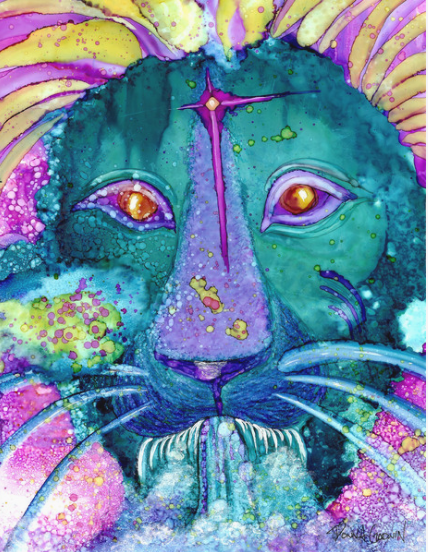 Prophetics owner Debbie Marino and one of our fine artists Avril Ward from the Cayman Islands will be attending The Breath And The Clay at Awake Church in Winston-Salem, North Carolina March 4-6th. Ray Hughes and Gregory Wolfe are among several that will be speaking and teaching at this conference. This is a wonderful opportunity to attend prophetic workshops on art, dance, music and writing. Reserve your tickets as soon as possible and learn more about this event by clicking on the blue link below. Also,Prophetics will be attending the CIATS (Christians In Action Trade Show) September 23-24th at the County Convention Center in Ft. Lauderdale, Florida. This is both a wholesale and retail trade show open to businesses and the public. Please come on out and visit us if you are in the area and stop by our showroom booth. 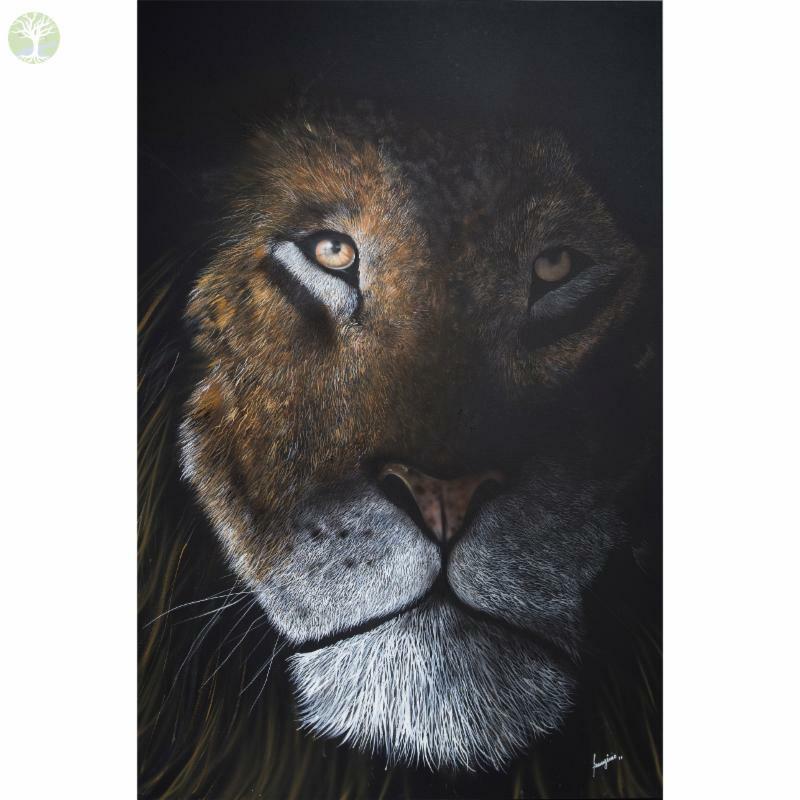 We would love for you to experience and purchase some of our beautiful Prophetic and Christian art from some of the finest artists in the world. We will be displaying several selections of original art, prints, sculptures and more at this show. You do not want to miss this wonderful event! Here are some of our featured artists with Prophetics for this month. Please visit our website to see their entire collection. Every art piece they create tells a story, gives a prophetic word or a Bible verse. Their art is inspired by God to bring light, hope, and love to many. We call this Art With A Divine Purpose! 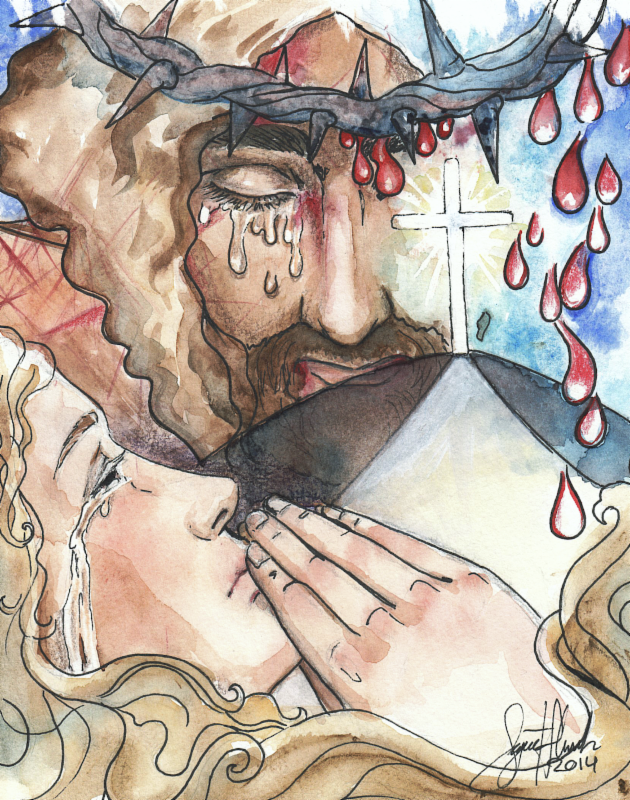 was inspired to do a series of portrayals depicting Biblical characters that speak to us of their mission from God. 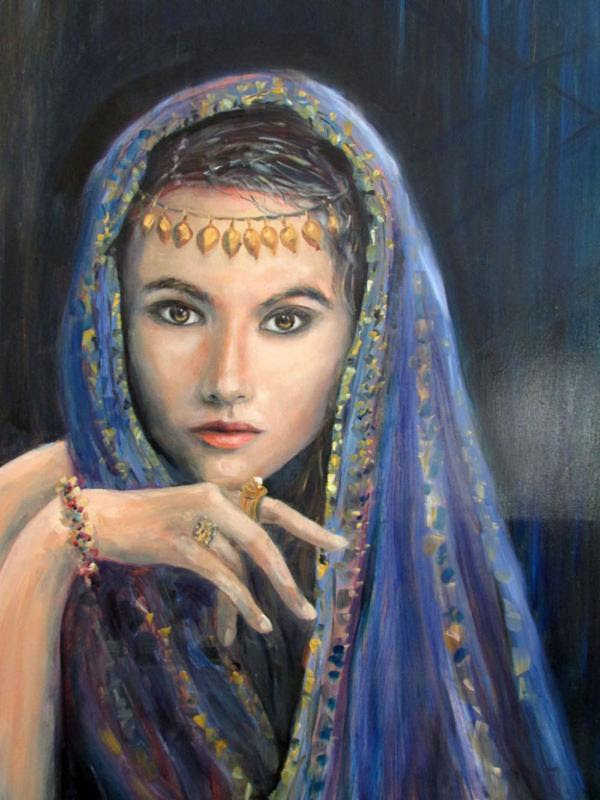 Esther displayed uncommon bravery and confidence in God. April's hope is that people will be inspired by Esther's story and receive a similar anointing in their life. Bronson is a prophetic artist from New York. His inspiration comes from his relationship with God who inspires him to paint his word, colors, emotions, and life experiences. 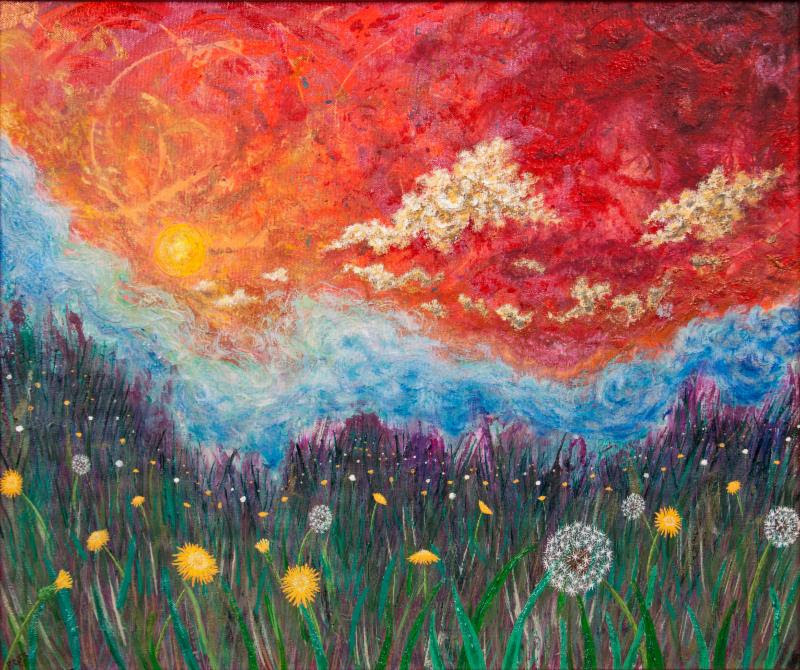 Bronson's art piece "Dandelion Dreams" uses elements of nature to describe the Son of God watching over everyone and the sky shows the color of Jesus' blood that was generously given for mankind. The clouds represent God's glory and victory. 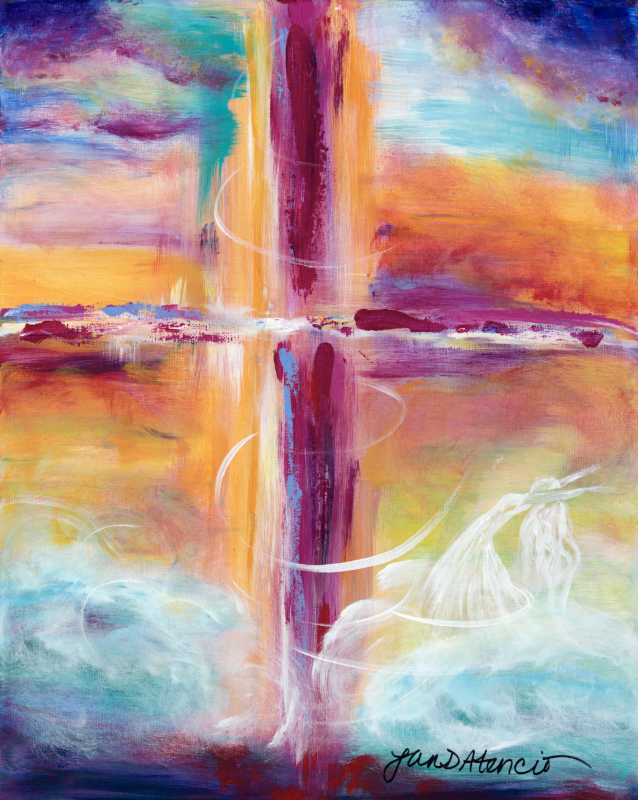 Bronson describes the Holy Spirit as flowing in this art piece to give God's children direction. Many of God's people experience different stages of surrender in their lifetime but God is watching over His people and surrounds them with His presence bringing them from one level of glory to another. Jack is a prophetic artist from Missouri. He creates most of his art from the prayer room at Gateway House of Prayer in St. Louis. He gets many of his concepts for his artwork by spending time in God's Word, prayer and worship. Jack's prophetic word for his piece "Valiant One" is that courage, peace, strength, and confidence are the qualities of a man of valor. 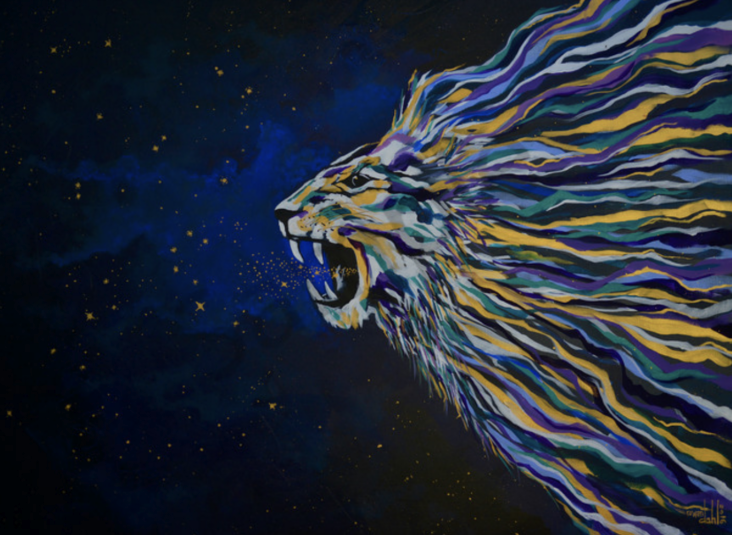 The face of the Lion is offset depicting that God is very close and illustrates His invitation to us to partner with Him and realize victory when we obey. 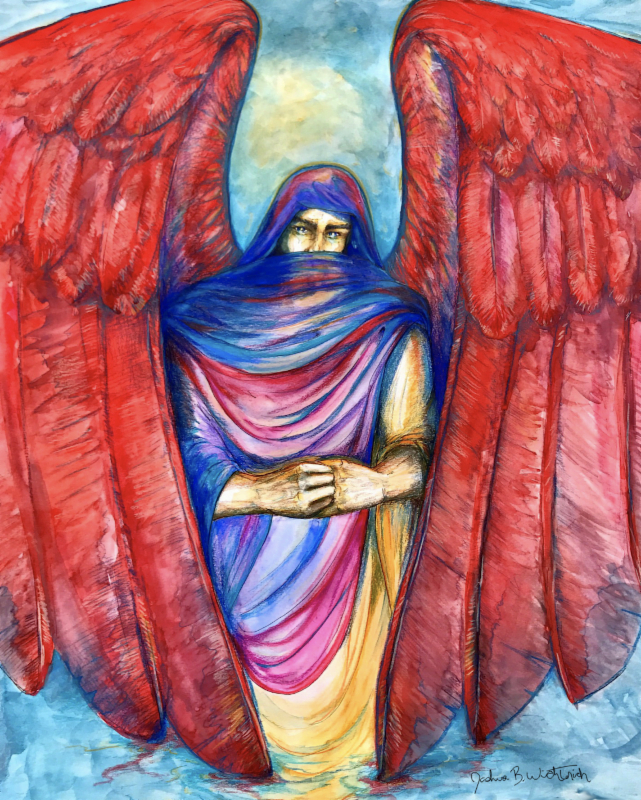 The Bible verse that Jack selected to go along with this art piece is from Judges 6:12, "And the Angel of the Lord appeared to him and said to him, The Lord is with you, you mighty man of fearless courage." Bruce is a prophetic artist from North Carolina. He is inspired by the spiritual themes that he finds in the Bible. As the Holy Spirit begins to stir up interest and excitement about a particular theme he begins to search out creative compositions that will have a powerful message and will glorify God. As Bruce prays and reads the scriptures a certain passage or theme will strike him and he begins by sketching it out with a pen. Once he has an idea in mind he begins loosely painting it on canvas. Jack believes that God's workmanship in him becomes His message to share with others. Froyle is a prophetic artist from Australia. She believes that art is spiritual and that every piece carries its own presence and releases the intention from which it has been created. Music plays a vital role in her creativity and it is the catalyst from where she draws her emotional expression. She believes that her art is one of joy and expresses this through color and texture which brings an atmosphere of hope. 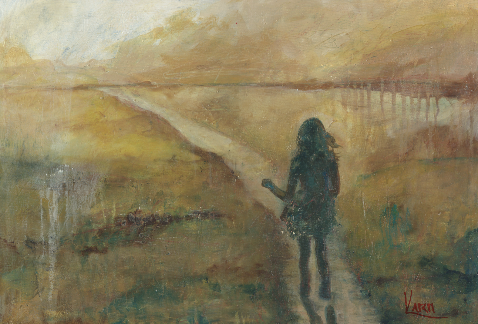 Her pursuit is that each of her paintings enhances the environment it inhabits. Prophetics is a gallery of Fine Artisans and Craftsmen from around the world that create with a heart to bring love, joy, hope, healing, peace, and more to a world in need of God's love. It is art with a divine purpose. 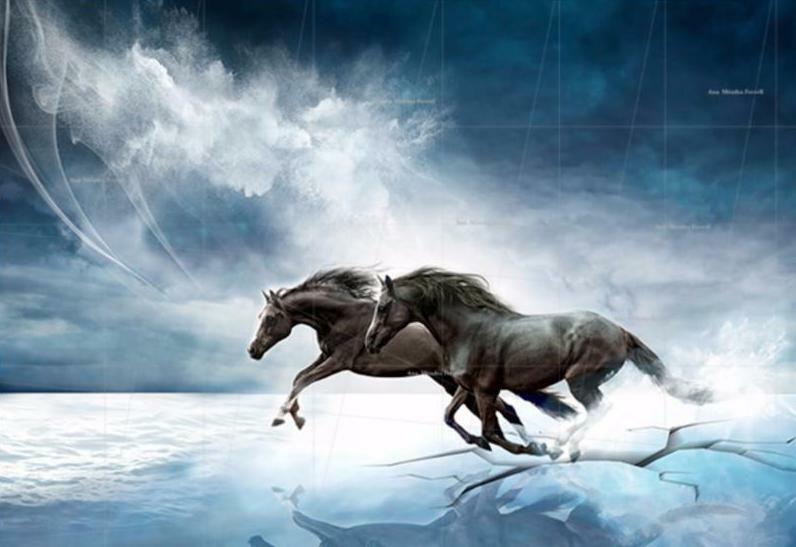 Prophetics Is The Largest Online Prophetic And Christian Art Gallery In The World. 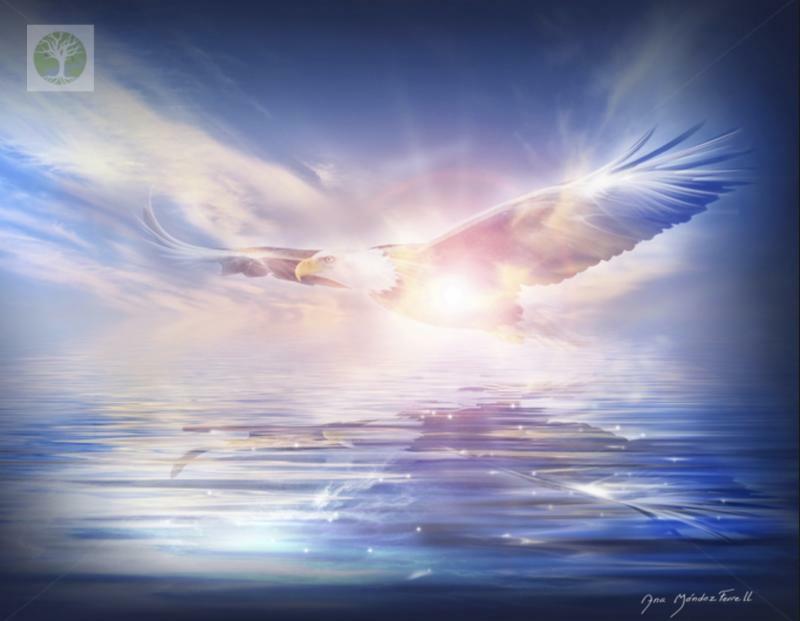 Prophetics Gallery can officially claim that they are the largest online prophetic art gallery in the world representing the USA, Canada and several countries overseas. Prophetics has been gaining momentum since July 2015 when they launched their online website. The word about Prophetics has caught on ever since and is well on its way to bringing the very best Prophetic and Christian artisans and craftsmen from around the world under one website. This gives customers the opportunity to purchase one-of-a-kind fine pieces of art, sculpture, photography, art apparel, ceramics and more. They also offer their customers the option of ordering an original piece of art or prints making it affordable to own a unique piece of art work. 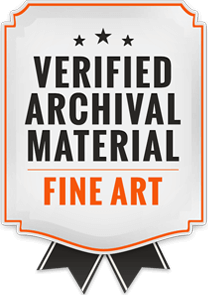 You may also select framing and matting options to complete your prints order. Visit our website to enjoy the many talented and creative artists that have a passion to bring God's word and love through their art form to the world. It is an experience of a lifetime. , MINISTRY TODAY, SPIRIT LED WOMAN, CHRISTIAN RETAILING, AND PROPHETIC INSIGHT NEWSLETTER. We are very excited to get the word out in the Christian community and to gain more customer recognition and sales. Also, look for Debbie Marino's article in the February issue of Charisma Magazine's "Prophetic Insight" online newsletter. Debbie is the owner and founder of Prophetics and will be writing an article on "The Importance of Prophetic Art". Debbie and her Prophetics team are very committed and serious about supporting and promoting talented fine Prophetic and Christian artisans and craftsmen from around the world. 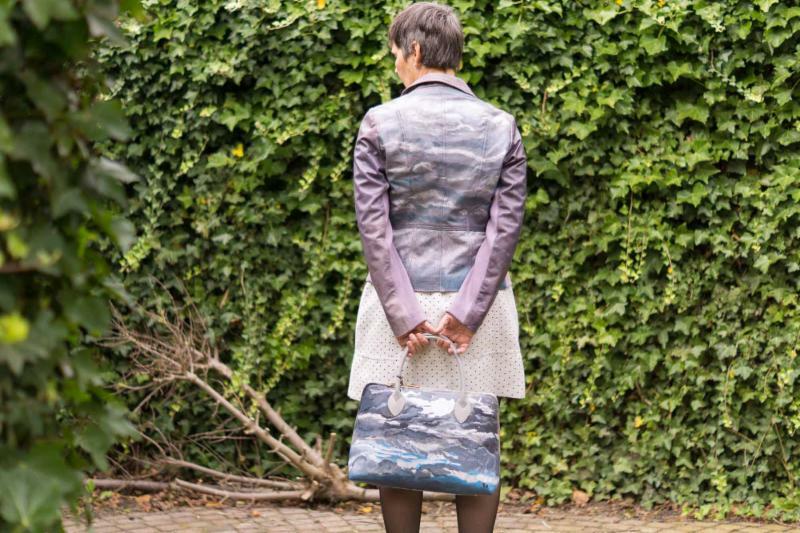 Artist Rebecca Siccama is a prophetic artist from the Netherlands and paints her beautiful art on leather jackets and handbags to create one of a kind pieces of art that are stunning. 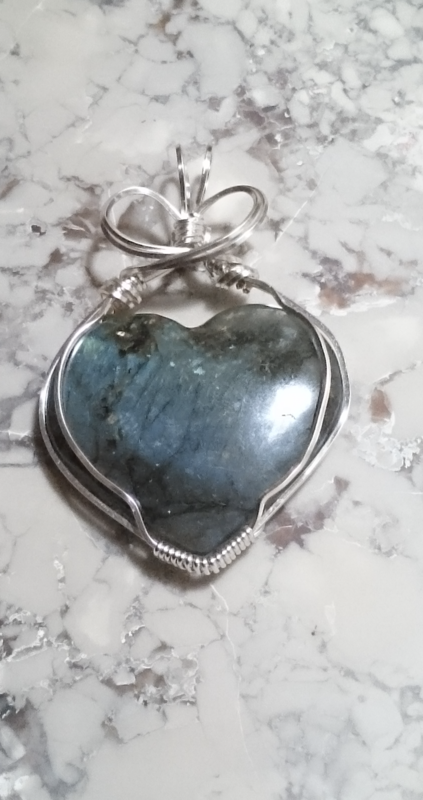 Stop by our website to enjoy her amazing creations and purchase a gift for a friend or a love one. 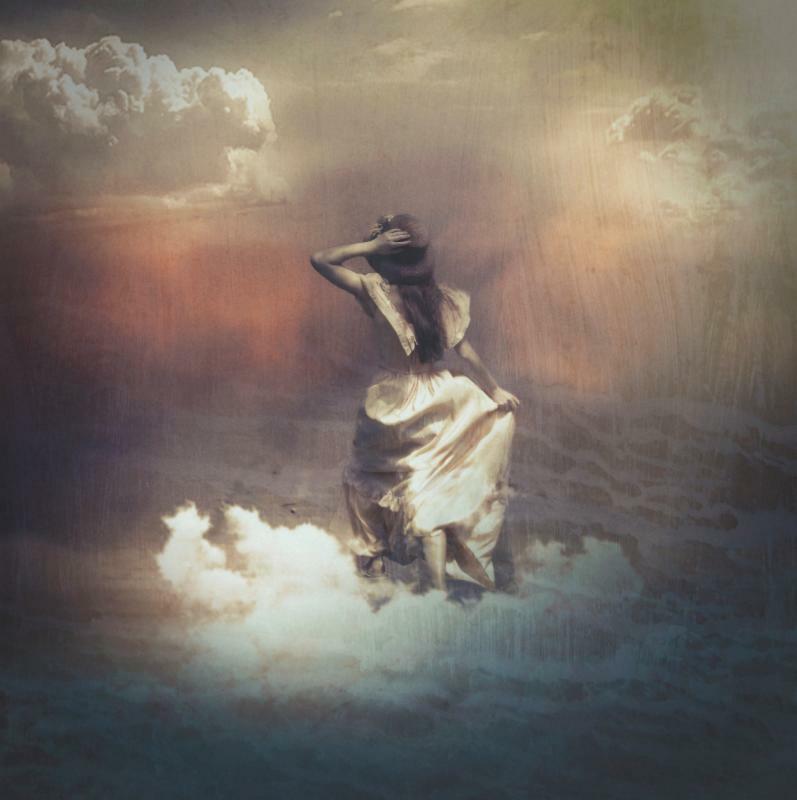 Summer Anthony joins our artisan team with her fine art photography. 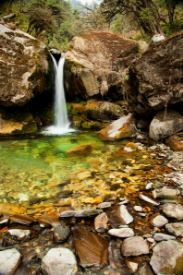 Summer is a graduate of Liberty University in Lynchburg, Virginia and is on her way to becoming one of the most talented fine art photographers the world has yet to meet. Enjoy viewing her work on our website and make sure to order some of her creative and innovative photography. Her prints would be a great gift idea for that someone special in your life. Prophetics just keeps getting better. In the month of October we added some very amazing features. 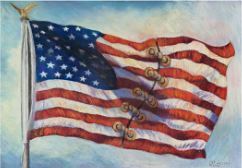 Now our customers can enjoy the benefit of getting prints or giclees of an original piece as well as framing and matting. The other unique shopping feature that we offer allows our customers to view their art in 3D in a room setting of their choice. We also added Sherwin Williams paint colors that they can select for simulation and show colors similar to their walls in their home. These features help our customers to chose art on the right scale for their home and make good sound decision before purchasing. Prophetics Would Like To Welcome Avril Ward to Our Team Of Artists. Avril is from the Cayman Islands and is known for her beautifully inspired prophetic sculptures of bronze and her painted art pieces. 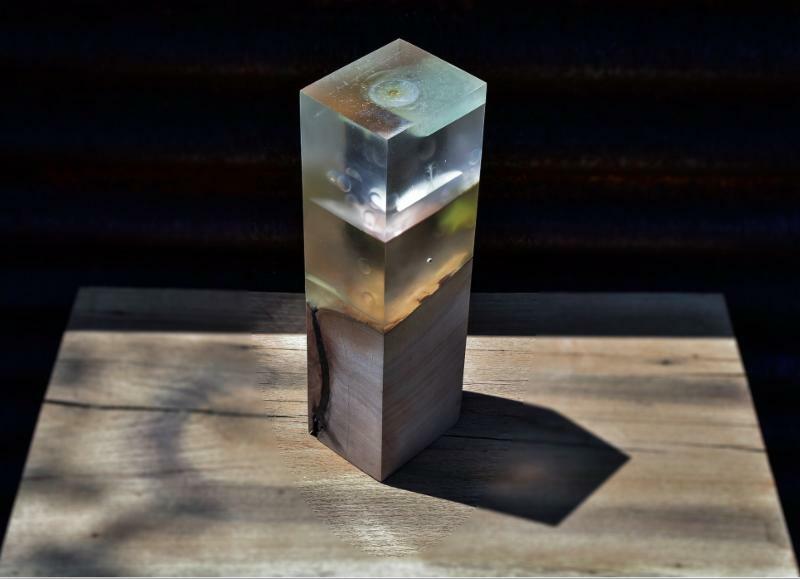 We invite you to our website at Prophetics to enjoy her limited edition sculpture collection. Remember Christmas is just around the corner and one of Avril's sculptures would make the perfect gift for someone special. 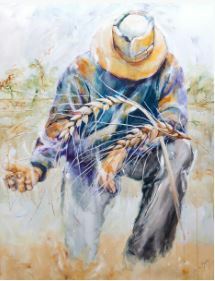 This art piece is entitled "My Brother's Keeper" by Avril Ward. In society today we hear a lot of talk about art with purpose and art that heals. There are many non-profit groups and organizations that have been formed to help communities with the proceeds from art sales to foster change. As the owner and founder of Prophetics, I promote Prophetic and Christian artisans and craftsmen from around the world who are inspired by God to create pieces that have a divine purpose. These divinely inspired pieces are anointed to bring about change and they help to bring God's Kingdom to earth. The art we exhibit has the ability to bring healing, hope, love, freedom and so much more. It touches many lives and helps to change atmospheres in cities, communities and cultures. I have spoken with many artisans and craftsmen over the past few months and they tell countless stories and testimonies of how their art has touched many people in their communities and changed their lives for the better. I have shared my own personal testimony in the past about how a prophetic art piece had helped change the life of my own son who suffered for years with severe anxiety and depression. 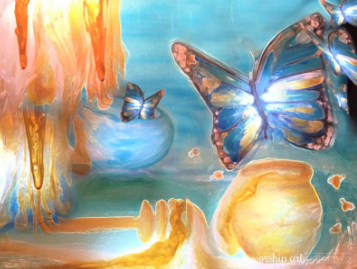 Psychologists and therapists use art therapy today as a means to help in the healing process. Also, many of our universities are now offering "Art That Heals" as part of their curriculum in training the next generation of students to use as therapy. 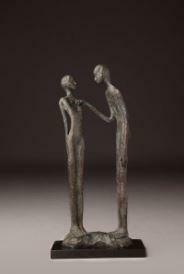 There is no doubt that art moves people and can change attitudes, mend wounds, bring hope and life. Experiencing art is no different than listening to great music or watching an inspiring movie. It can change the way you feel and think. Prophetics is proud to represent the finest Prophetic and Christian artisans and craftsmen in the world. We invite you to experience a very unique and exquisite gallery of divinely inspired artists who help to change lives with their work. Prophetics promotes art with a divine purpose that will change our communities, cities, and cultures bringing hope and love. 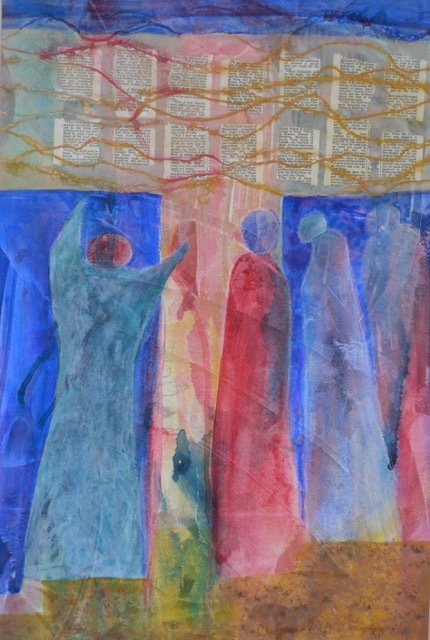 The art piece featured above is by prophetic artist Patti Hricinak-Sheets and is entitled "Trinity". 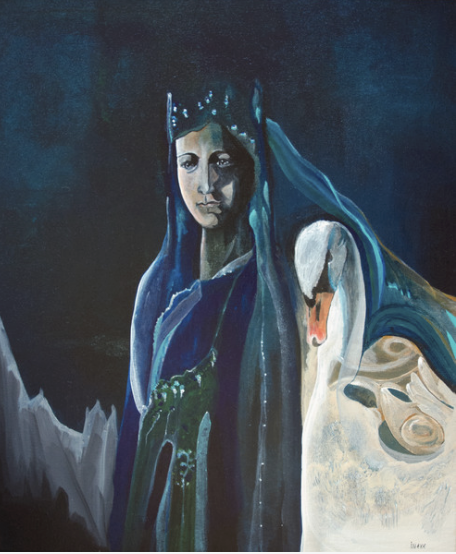 We are very excited and proud to announce that Alice Arlene Briggs has joined the artist team on our Prophetics website. Born in Michigan, raised in Carlsbad, NM in a family who loved to dabble in all kinds of crafts, Alice was encouraged from an early age to try new things. After degrees in Biology and Chemistry and Occupational Therapy, the artistic side of her demanded a larger voice. 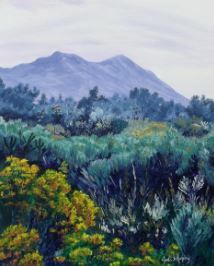 When she returned to Carlsbad, Alice began taking art classes offered at the local branch college of New Mexico State: drawing, pastel, watercolor, and oil. She first took the classes somewhat on a dare, but quickly discovered that she absolutely loved it and took as many as she could. A few years later, a friend asked Alice to take a weekend class with her taught by Helen Gwinn in which she discovered the wonders of acrylics and collage. Alice was blessed to be able to study with both Helen and Lynette Watkins three times at La Romita, and once further North in Italy where she added many new techniques to her repertoire and was greatly influenced by the instructors and fellow classmates as well as the cultural heritage and natural beauty of Italy. As Alice worked in the studio, she noticed that it was while she was in the midst of the creative process that she felt the pleasure of my Creator the most. 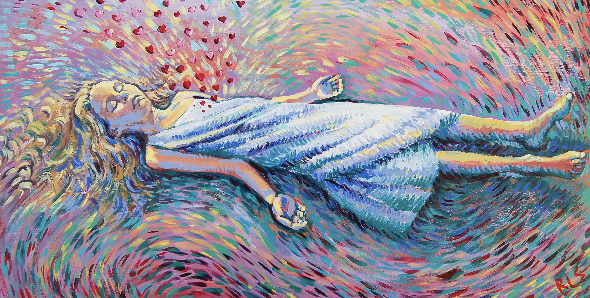 Alice's technique involves multiple colors, layers and techniques to generate depth, richness, texture, and energy that invite one to interact with the piece as elements are revealed to the eye. Her work tends to reflect some aspect of her life at the time and is an expression of worship to the Artist of all Creation to whom she owes her everything. Alice's hope for her work, is that it would bring peace, hope, and joy to each viewer. Her desire, as you look at a piece, is that it would speak something just for your heart, mind, and soul, and that it would bring an atmosphere of peace, rest, and wholeness whereverit is hung. Alice may make mention of what a piece means to her, but if it speaks of something else to you, please hold on to the meaning that it has for you. It has served its purpose in my life, but now it has something to give to you. May it be a blessing. Our online international gallery is stirring lots of interest in the online and wholesale marketplace. We are rapidly expanding and modifying our website to accommodate the interest and needs of our customers, fine artisans and craftsmen from around the globe. So we have some exciting news!!! Prophetics has decided to expand our website to offer a better ordering system and more exciting features for our customers. We are currently redesigning our online e-commerce system to offer prints and giclees of our artist's originals. Several paper, canvas, acrylic, metal, matting and frame options will be made available as well. The check out cart will also be much easier for our customers to use when making their selections and ordering. Our system will be upgraded to accommodate all of these options within the next two weeks. We will now have wonderful digital imaging experts that do all the copying, matting, and framing. The other nice feature about our new system is that our customers can see their art selections in 3D in a room setting of their choice. They can select paint color options which will best simulate their home wall color and be able to view the art against the paint backdrop. This will make it easier for our customers to make their selections visually and effectively. Therefore, the art piece can be viewed on the wall just like it would appear in their home and be able to make a good sound decision when buying their art online. This is a great feature for our wholesale trade buyers and interior design members to use as well. We will also be able to bring these wonderful new features to the international wholesale markets in the USA that Prophetics travels to each year with our select group of fine artisans and craftsmen. Prophetics and it's owner Debbie Marino were officially made members of the CIVA - Christians in the Visual Arts Network on September 27, 2015.